While camping near Kingston earlier this month, my family and I planned a trip to the National Air Force Museum of Canada in Trenton. 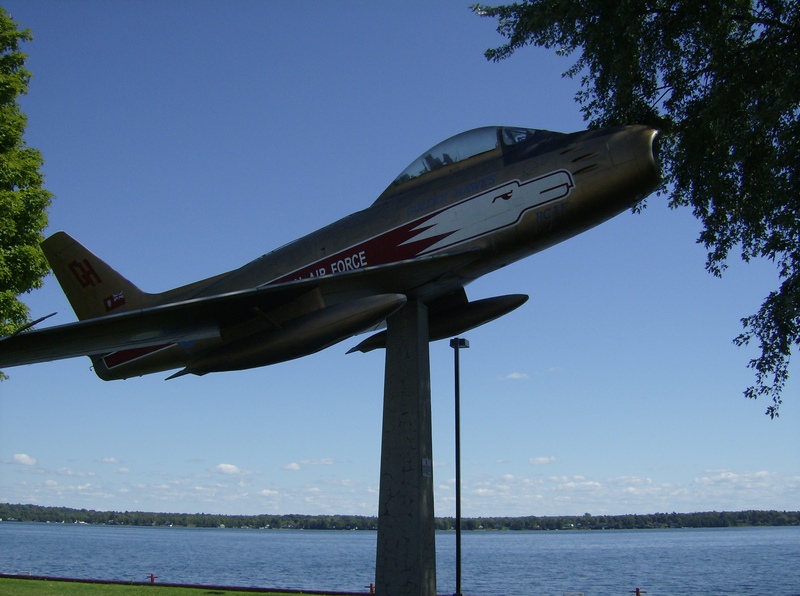 Trenton is a small, ordinary city on the Bay of Quinte; but one thing that makes this community exciting is the presence of CFB Trenton. 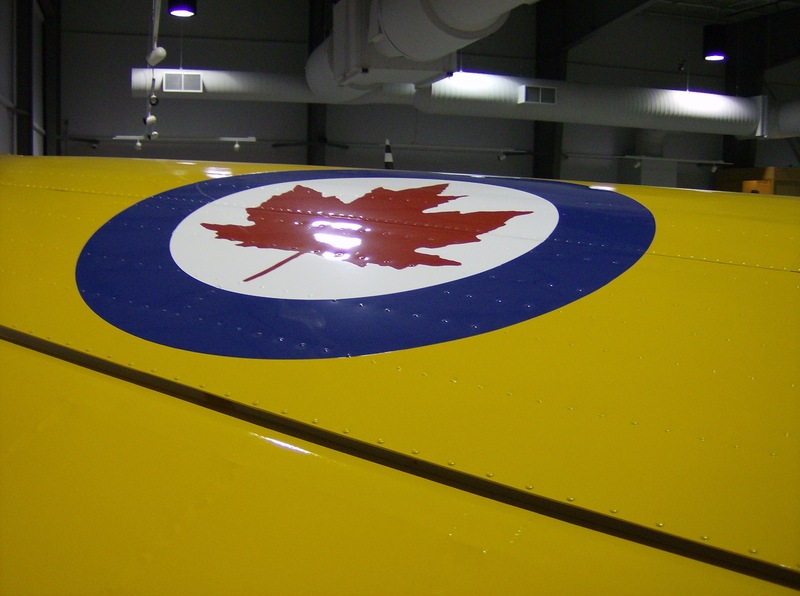 CFB Trenton is home to 8 Wing, which operates several large aircraft types such as the C-130 Hercules and C-17 Globemaster III. 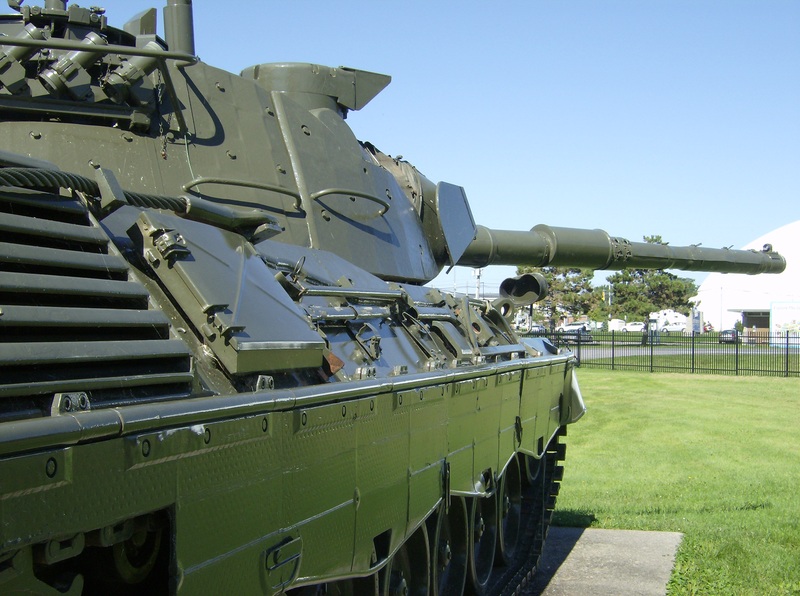 The Museum is also located on the base (or right beside it), and my anticipation grew as we drove into Trenton. Enormous hangars lined the road, airmen were walking around outside, and past the hangars several aircraft could be seen on the tarmac. 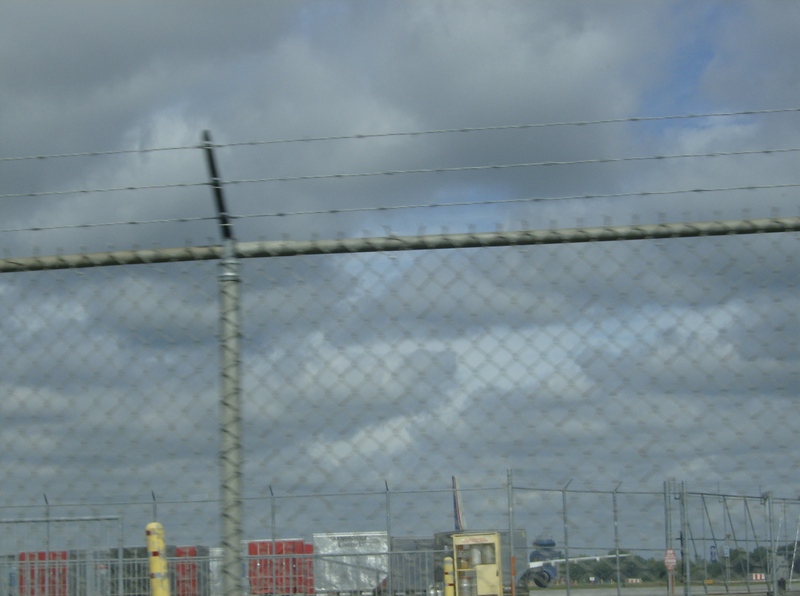 I even caught sight of a Globemaster behind one of the hangars- just a glimpse of its tail, though, which was pretty unsatisfying! Once we reached the museum my disappointment dissipated, however. There were so many wonderful and unique aircraft and exhibits at the museum that I was distracted quite quickly! 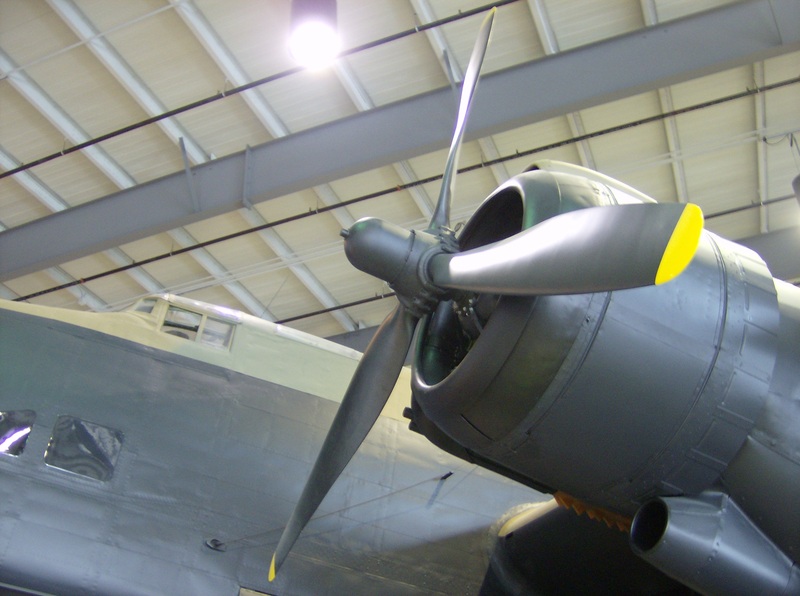 The National Air Force Museum occupies one building which houses a few aircraft and all other displays, while the bulk of the planes are outside in a sort of memorial park. 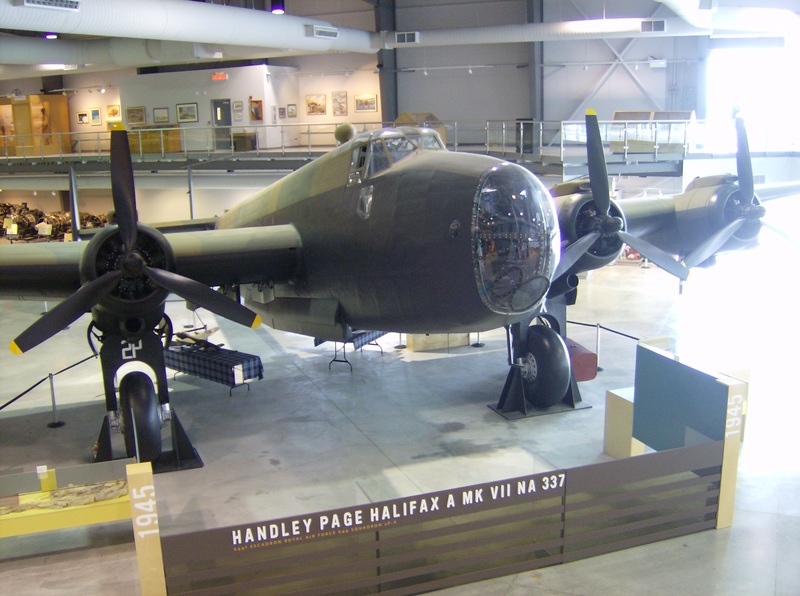 The showpiece of the museum, a Halifax bomber which actually went down during a mission in Norway, dominates the main room of the museum building; while elevated walkways offer superb views of all the interior aircraft. 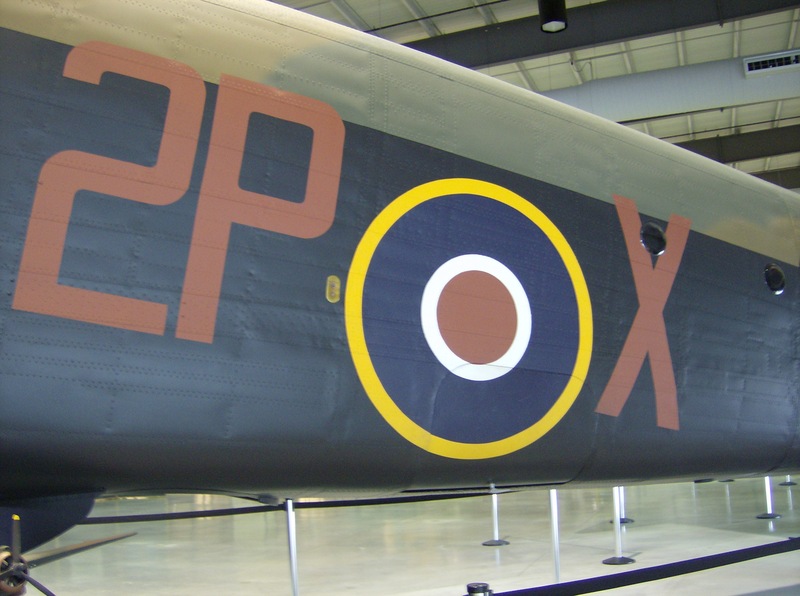 Often compared to the Avro Lancaster, the Handley Page Halifax was one of the RAF’s primary heavy bombers of WWII. 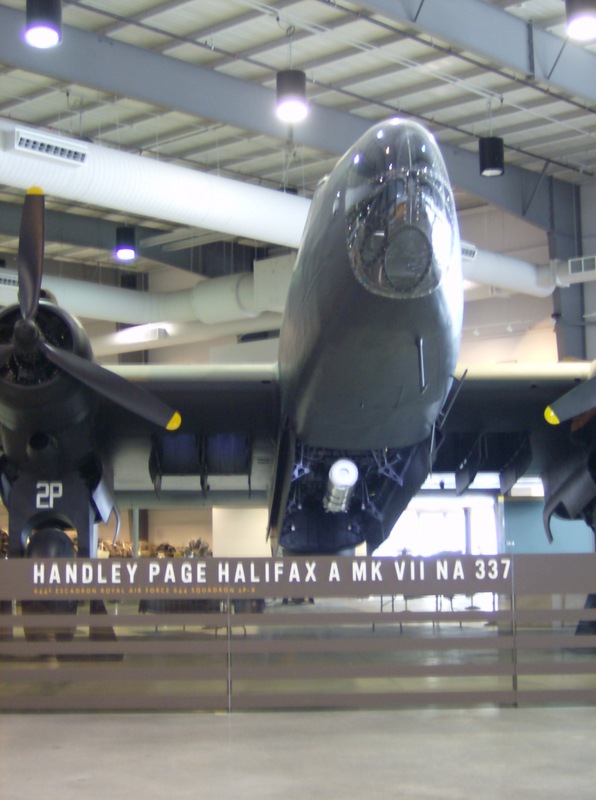 Halifaxes flew over 80,000 sorties for RAF Bomber Command, and were also used by Canada, Australia, the Free French, and Poland before the war was finished. 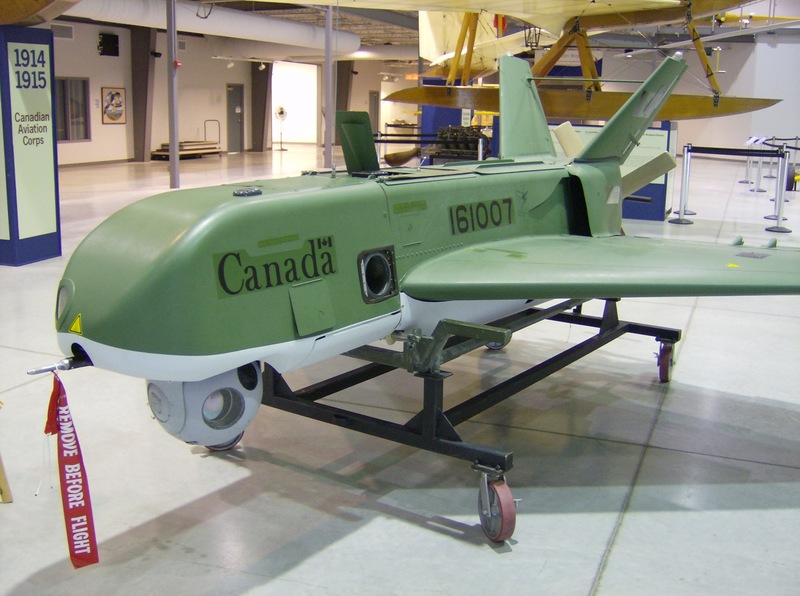 Beside the Halifax were a few extremely old (like pre-WWI) aircraft, and an odd-looking modern drone. 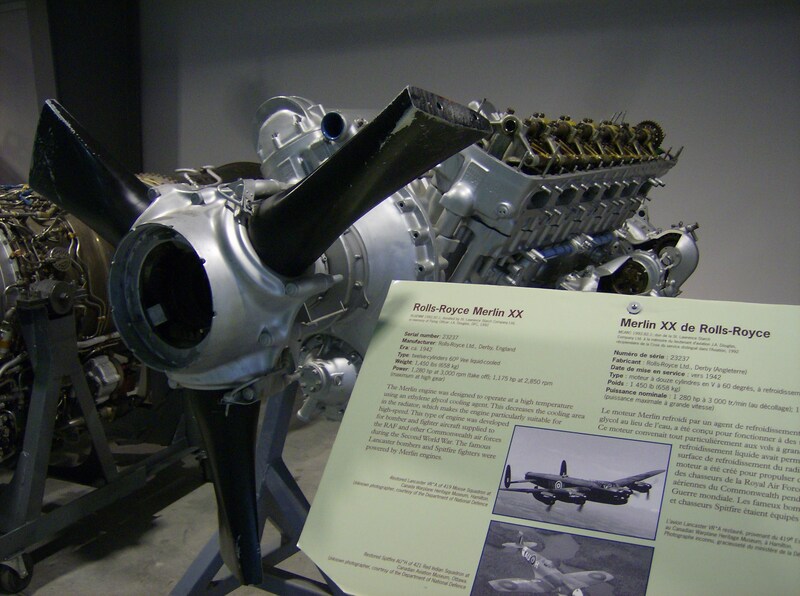 The museum also had a large collection of aircraft engines from notable aircraft. 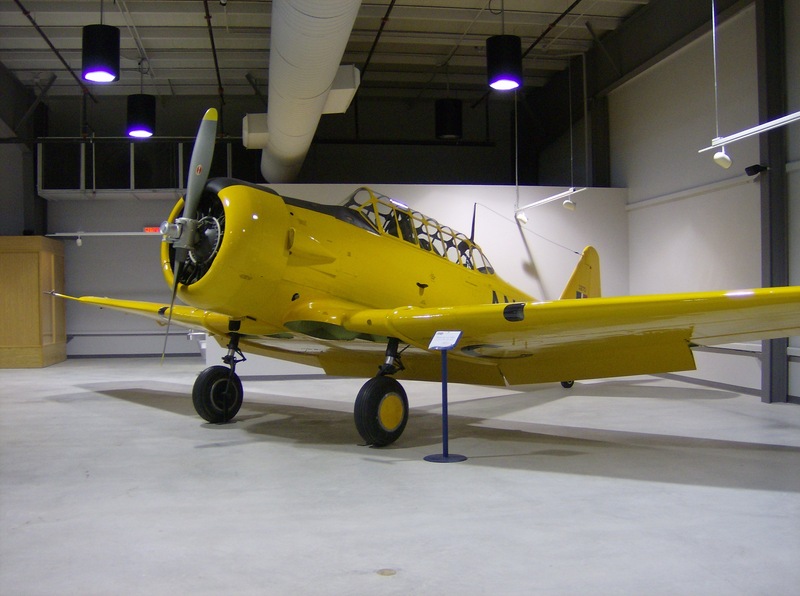 Upstairs, there were a few more aircraft; including one of my personal favourites, the Harvard. I’m used to seeing the Harvard in formation in the sky, and it was really interesting to see one up close here instead. 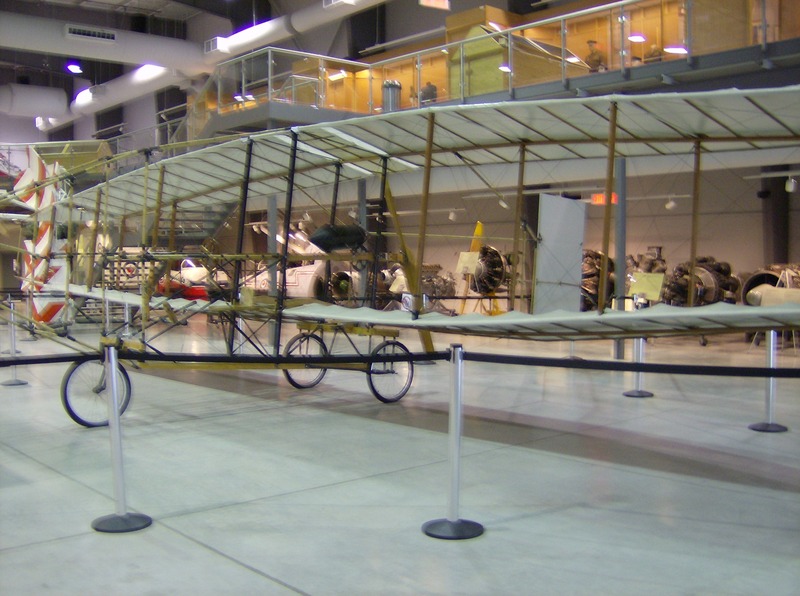 One exciting and unique element of the National Air Force Museum was the inclusion of several hands-on exhibits. One of these was a miniscule but complete Cessna 152, which was open for visitors to climb into! All the primary controls were still connected, as well- so my brother and I got in and had a great time pretending we were flying. I must have forgotten that I’m 20, because I was acting like a delighted little child! It was just awesome to be in the cockpit, as if I were truly flying. 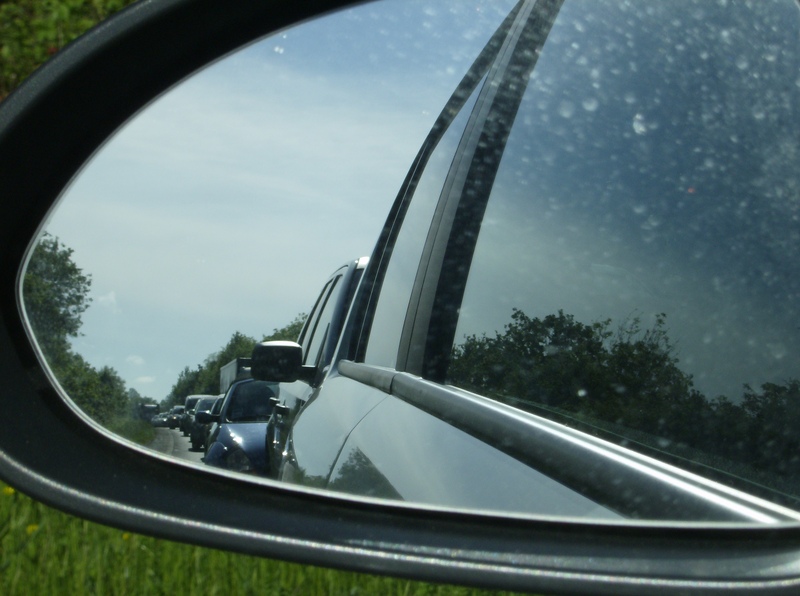 Plus, it was nice that the controls were connected- that meant, for example, when I pulled back on the yoke I could look out the rear window and see the elevator tilting behind me. 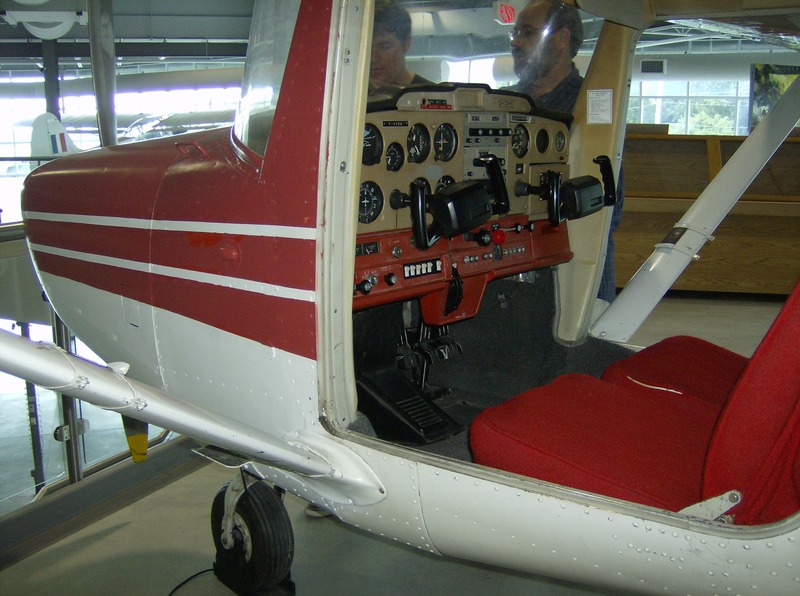 It reminded me of when I took a flight in a larger Cessna 172 a few years ago, and got to actually take the controls myself. 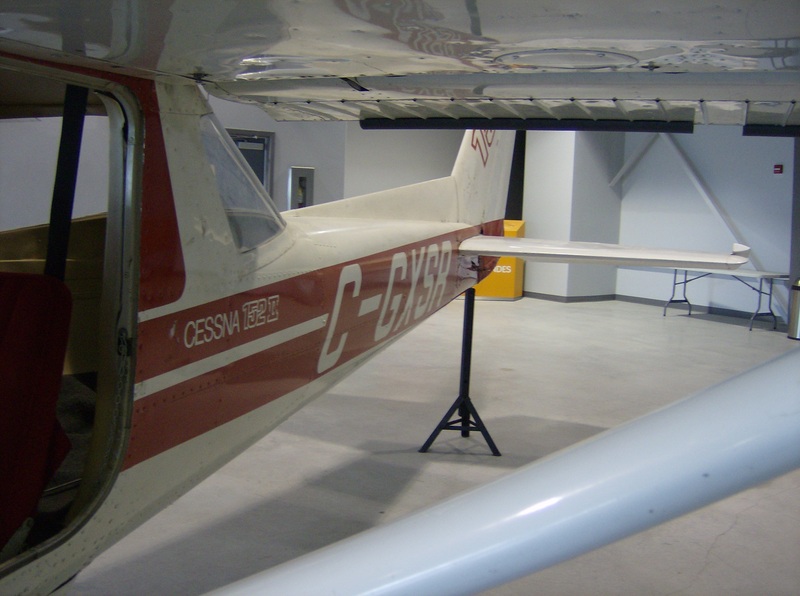 The Cessna 152 is so small- it weighs 1,000 pounds empty- that all it requires is a 110-horsepower engine! Another cool display was the cockpit of a CT-114 Tutor jet, which was also open to visitors. 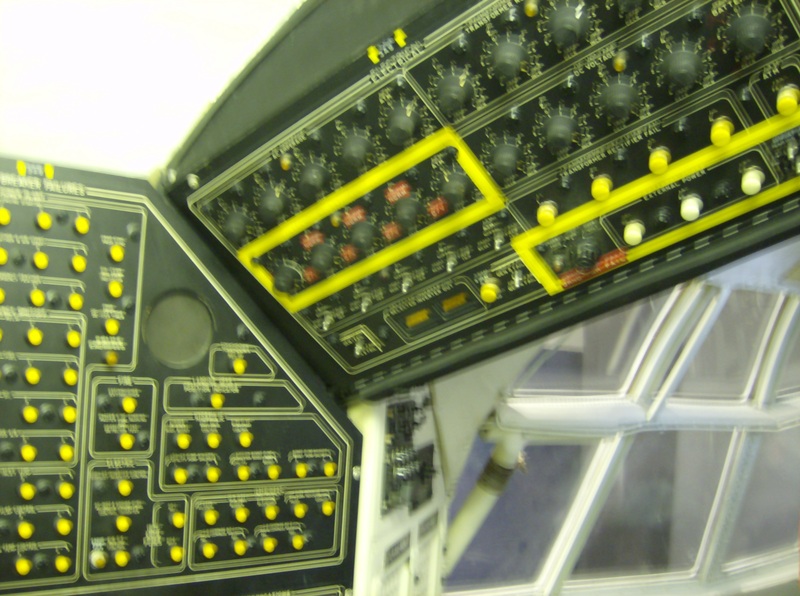 It was also fun to sit in it and examine all the controls. 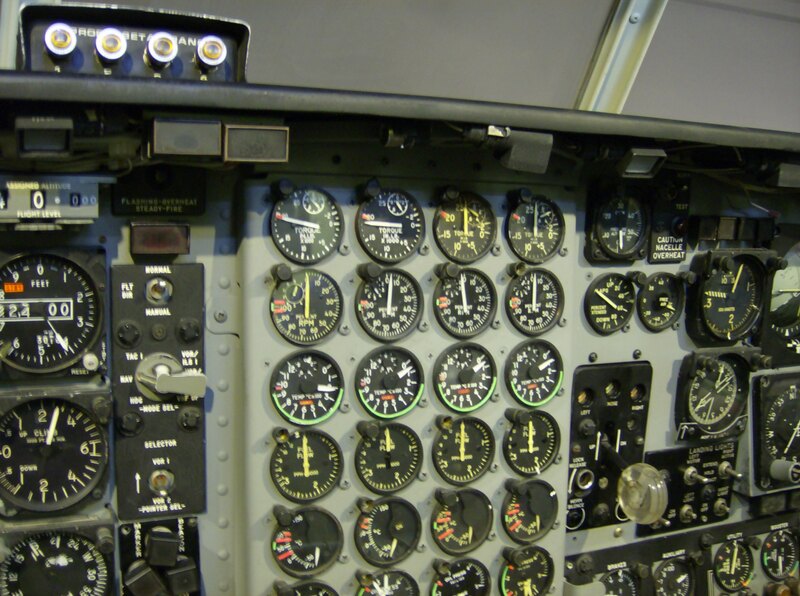 Needless to say, the Tutor cockpit was much more complicated than the Cessna’s! 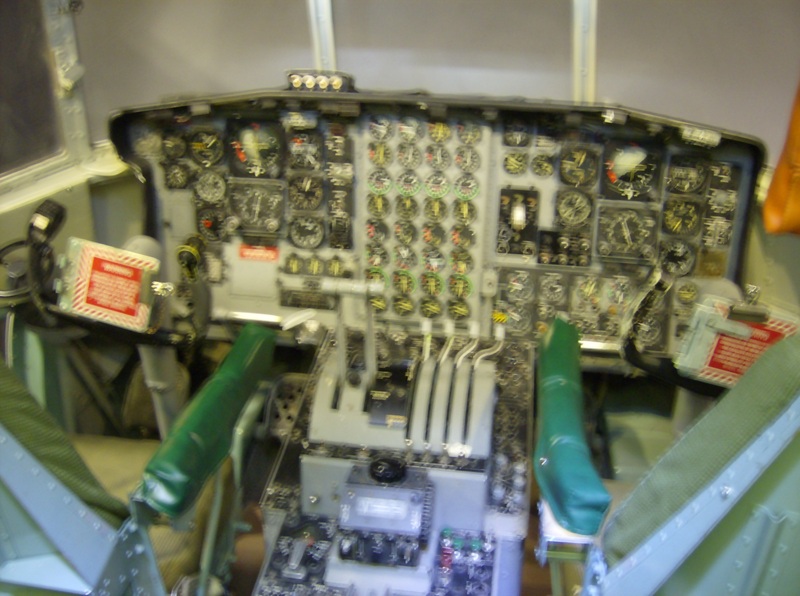 Jet trainers are interesting, and I really liked sitting in the CT-114, but the undisputed pinnacle of the interior displays was a full C-130 Hercules cockpit. It didn’t look like much from the outside, but inside it was stunning. 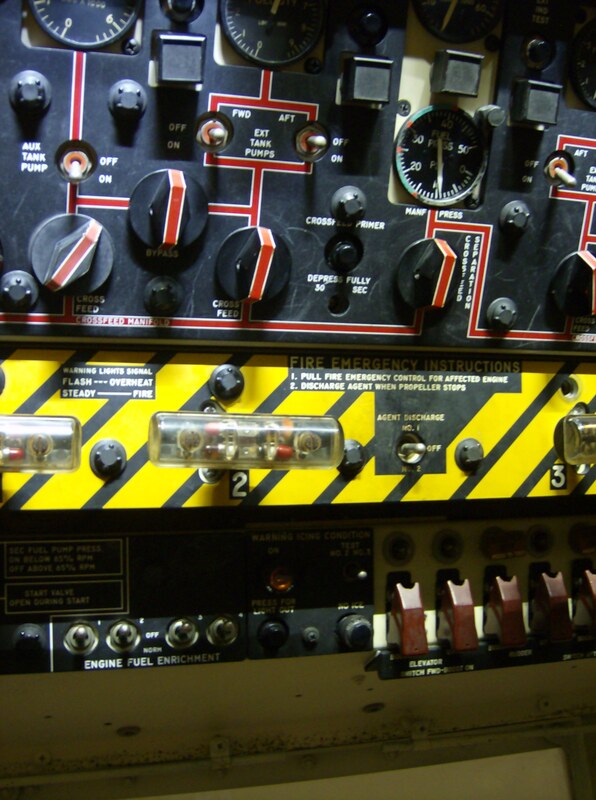 The walls were covered in dials, circuit-breakers, and switches, and I wanted to look at them all! 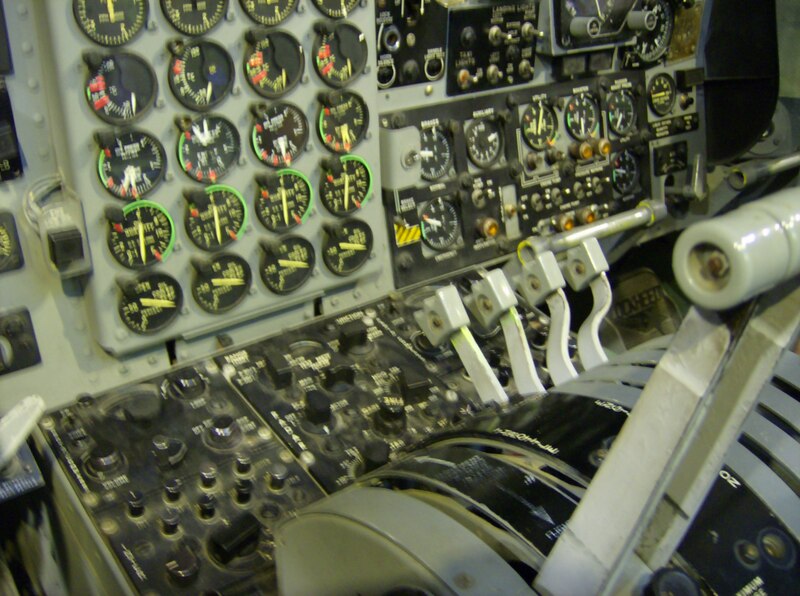 I rushed into the cockpit and took the captain’s seat, and I could have easily spent an hour or more in there! Immediately, I set about locating all the most important instruments and pretending I was preparing for take-off. It might sound a bit daft that I was so enthralled, but flying just has such an intrigue for me. If I were not a writer, I think I would probably join the RCAF and be a pilot. 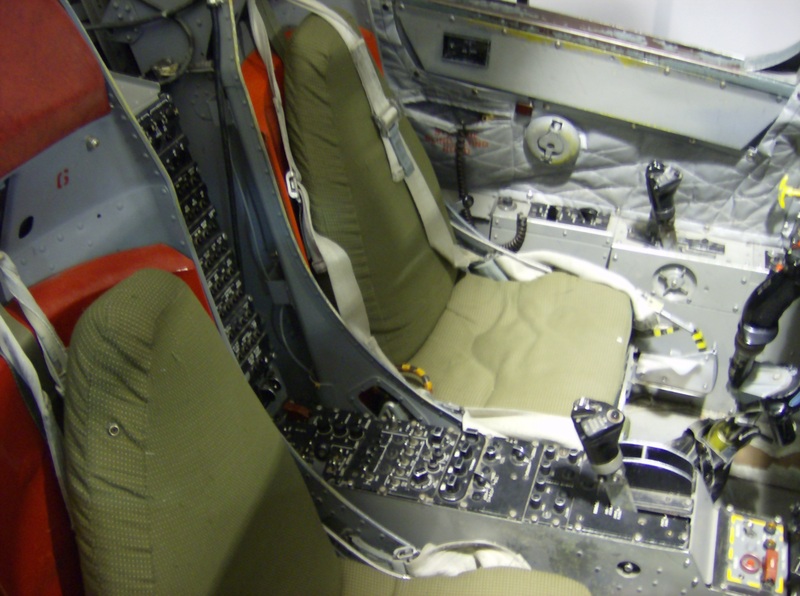 On the Hercules flight deck, there are three seats- two at the front for the pilots, and one set behind and between those seats for the flight engineer. And you’d certainly need three people in the cockpit, because there are just so many things to be aware of! My favourite part of the cockpit was probably the throttle, just because it was fun to use. 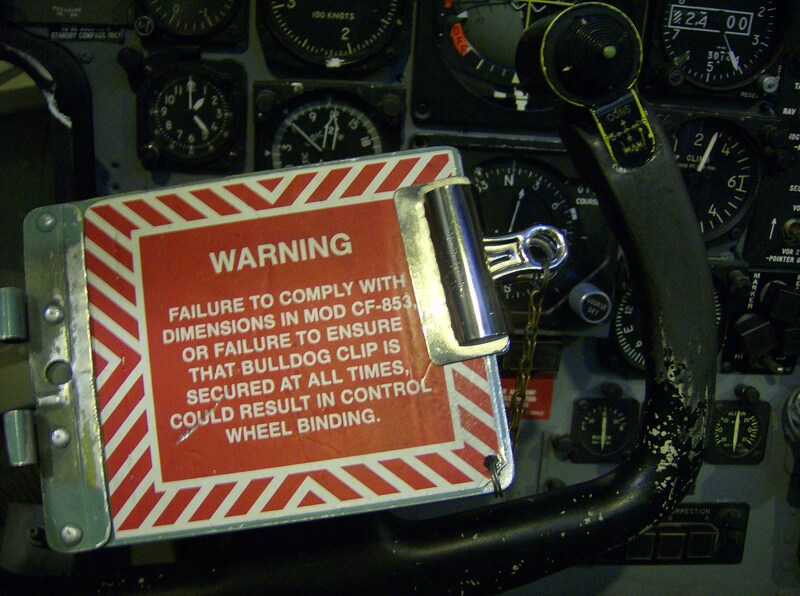 Another fascinating thing was a checklist on my left, telling the captain what to do before an emergency landing. The co-pilot had a similar one on his right. 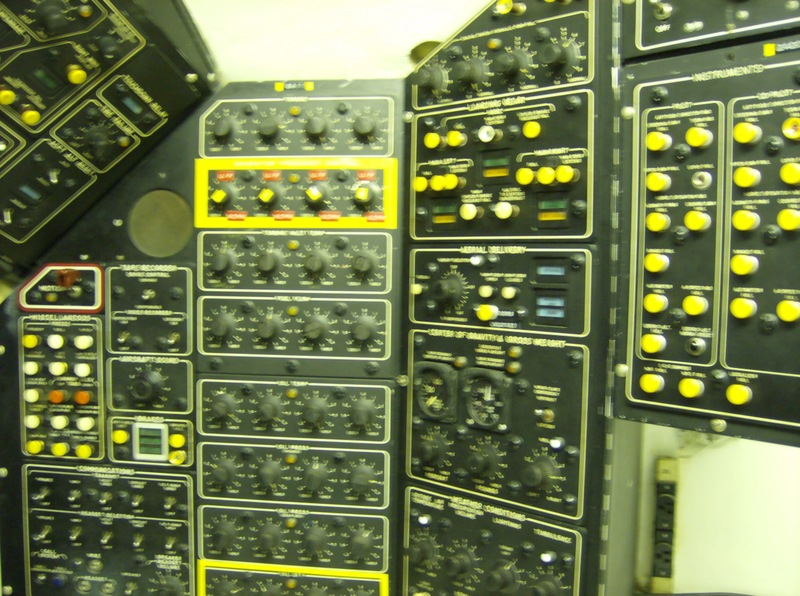 Eventually, of course, I had to leave the Hercules flight deck… and I was very sad to do so! It was such a wonderful experience, and I really felt like I’d gotten a glimpse of what it would be like to fly this noteworthy aircraft. 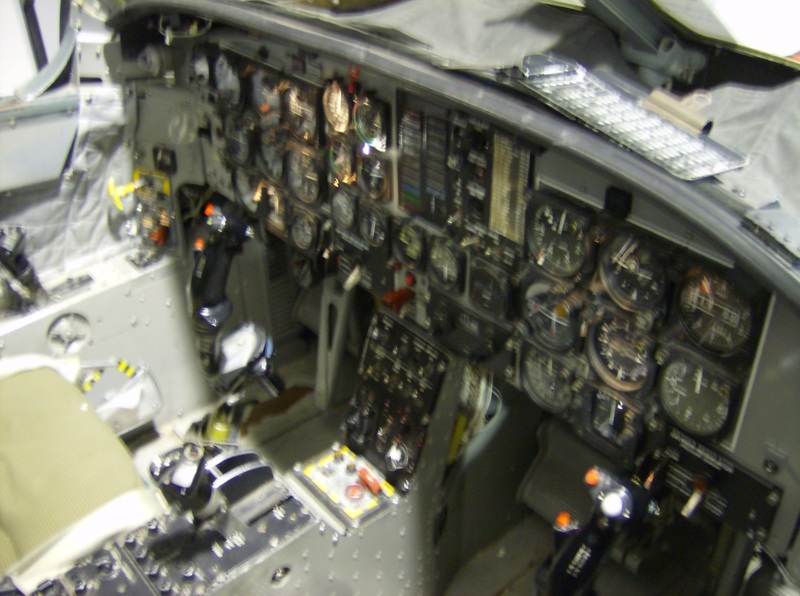 I’ve been to museums in the past that have had cockpits open to visitors, but they’re usually from something like a CT-114 and not a massive, complex plane like the Hercules. So this feature really made the National Air Force Museum stand out. 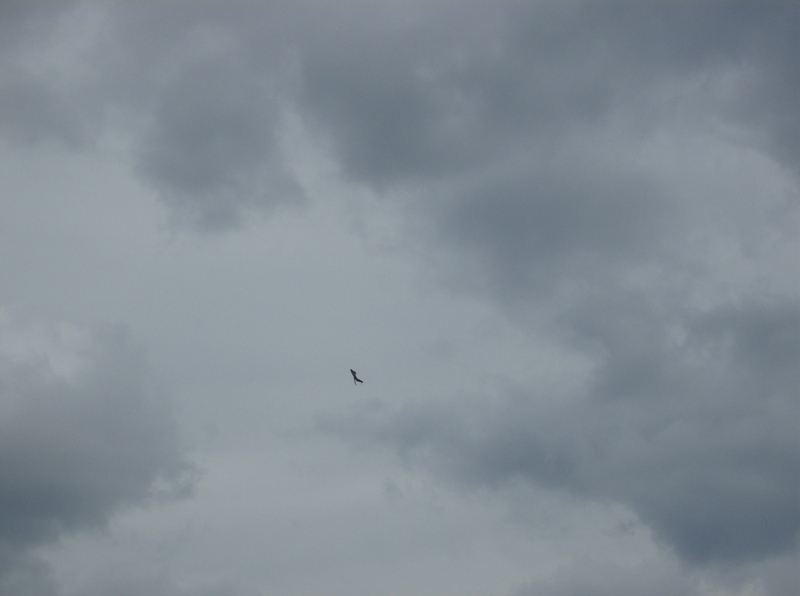 It also made me remember how badly I want to get my pilot’s license, so for the rest of the day I felt quite wistful! Fortunately, as this series’ next post will demonstrate, the museum had plenty more fabulous aircraft for me to marvel at; and that only added to the brilliance of the day! I am not a spontaneous person; I am not hugely fond of surprises or changes in plan, and I like to plan everything well in advance in order to prepare for it. However, even I must admit that there are situations in which spontaneity is necessary and beneficial! One such situation surfaced this past June, when my dad found out (on short notice) that he had to travel to Birmingham, England, on business. 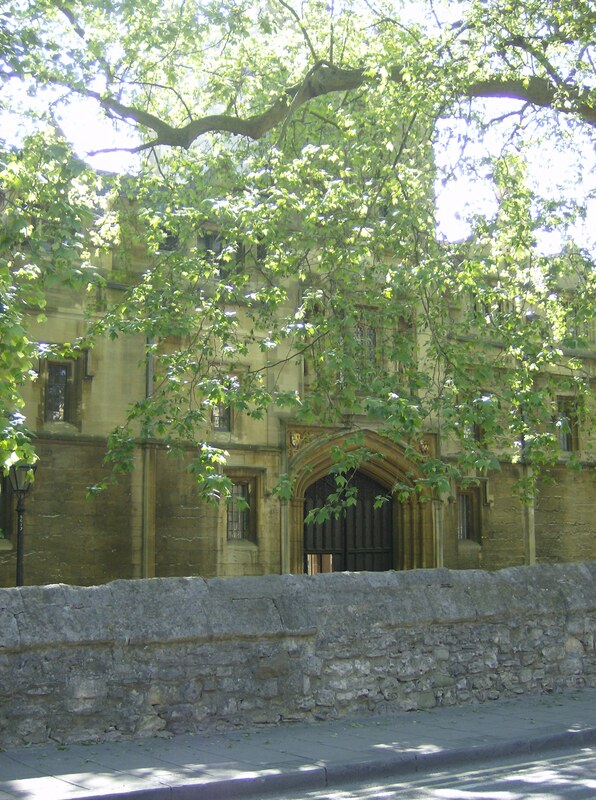 Of course, loving England and missing it incessantly, I expressed regret that I couldn’t go as well. So I was both delighted and surprised when, the next morning and less than a week from the departure date, my dad suggested that I could come if I was willing to pay for it! I doubt I need to state that I agreed; and five days later we were crossing the Atlantic and on our way to London. 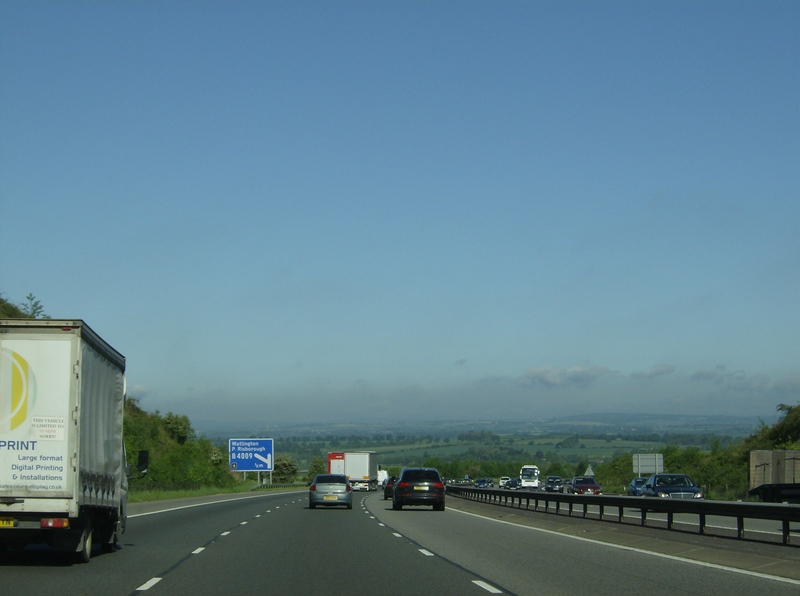 We arrived on a beautiful clear morning and picked up our rental car, and by 8 am we were on the motorway north to the Midlands. It really was a glorious morning, perfect for a drive. I marvelled at the greenness of the trees- back in Canada, trees were hardly in leaf yet after a horrendous winter- and felt so happy to be in England again. 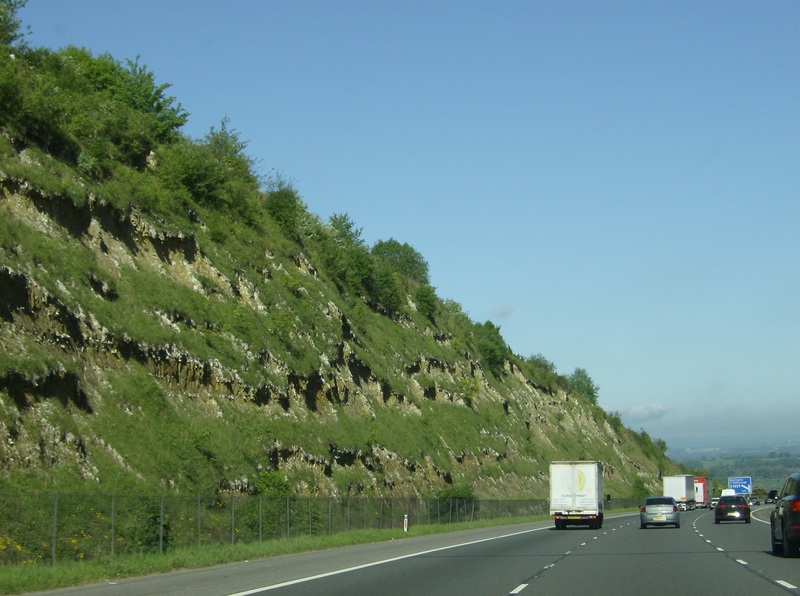 One amazing moment came not too long into our journey- the M40 went through a sort of escarpment, and then the landscape opened up into the beautiful green fields that I remember so well. It was breathtaking. 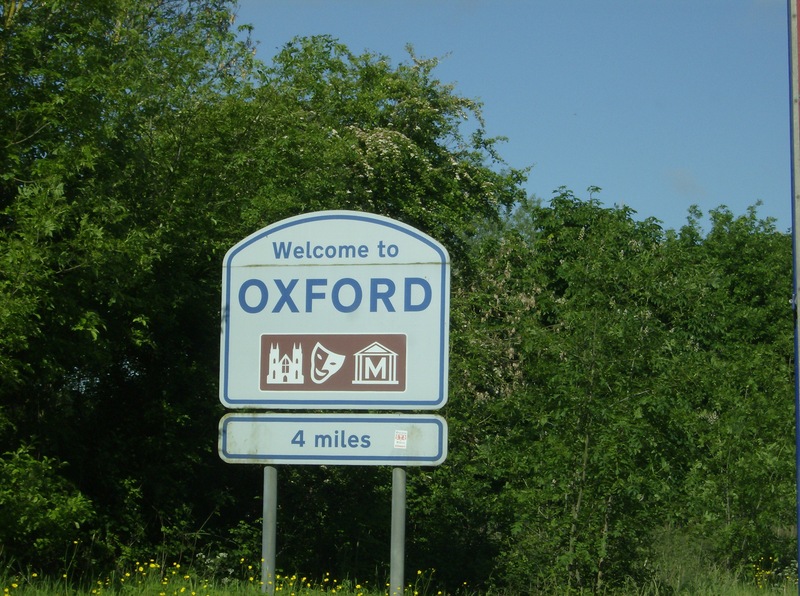 Since we left London so early and check-in time at our Nuneaton (east of Birmingham) hotel was likely 3 pm, we decided to take a detour through Oxford. 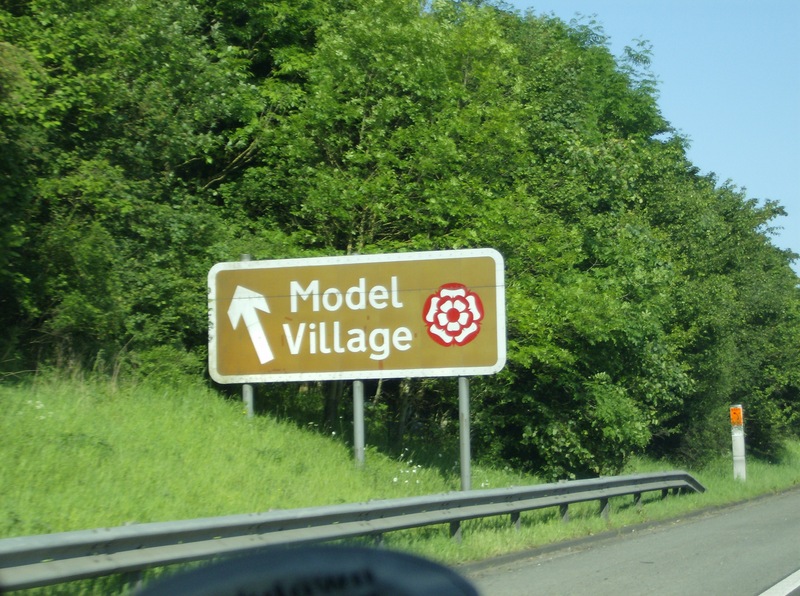 I’d been to Cambridge before, but I was eager to see England’s other famous university city. 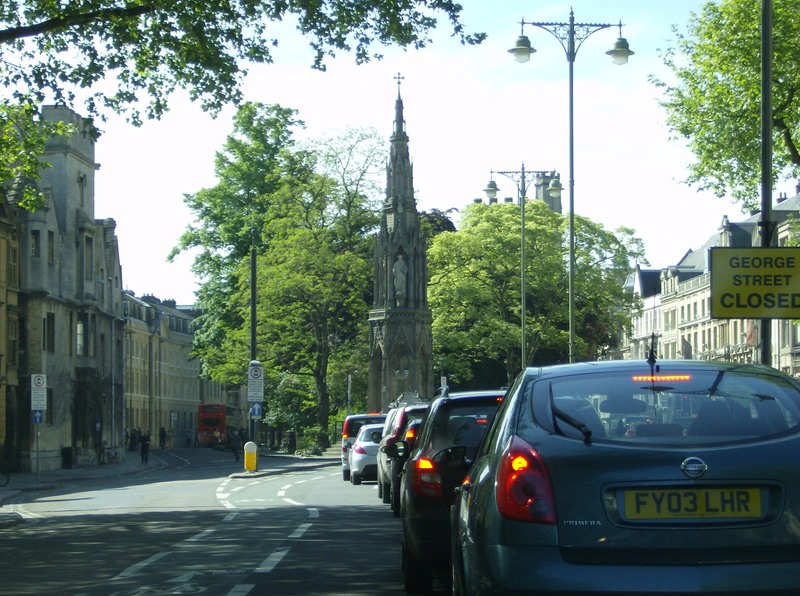 Once we got near Oxford, there was a massive queue to get into the city- due to both roadworks and morning commuters. Apparently there, but not there yet! The wait didn’t adversely affect my enjoyment of Oxford, however. We only spent about half an hour driving about the city (and we were going slowly, due to the traffic), but I saw so many gorgeous old buildings and it was a really lovely place. 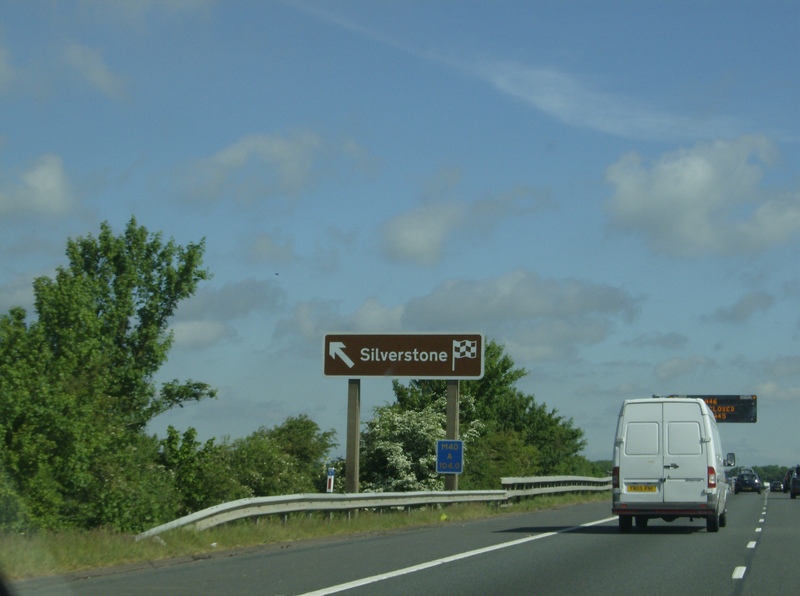 After our brief and unfortunately incomplete tour of Oxford, we got back on the M40 and continued north. Having earlier endured an overnight flight across the Atlantic, my dad and I were both tired and were becoming eager to get to the hotel and rest. 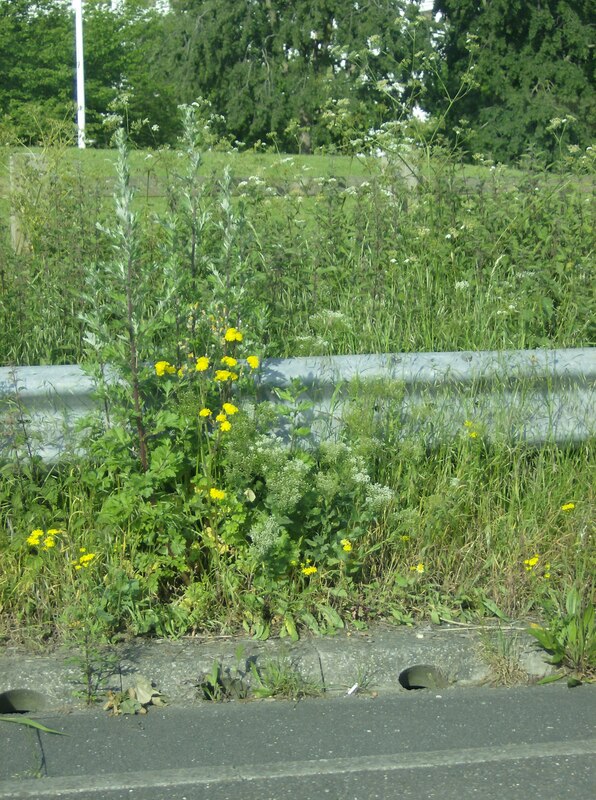 Even on the motorway, though, and through the sometimes grim and industrial Midlands, there were still interesting things to see. 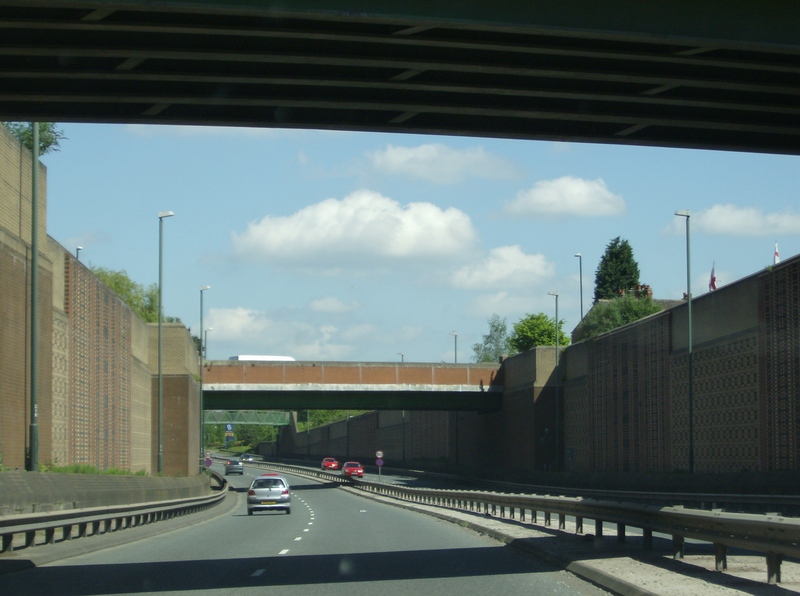 The last notable sight before reaching Nuneaton was Coventry. I was looking forward to going through this city, because of its harrowing experience during WWII. 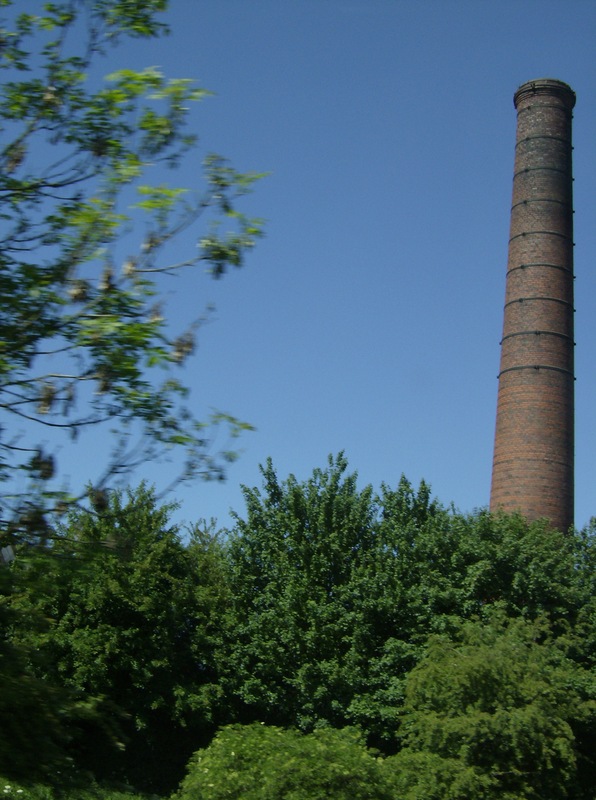 An industrial centre crucial to the British war effort, Coventry endured what is known as the Coventry Blitz. German bombing raids targeted the city; destroying homes, factories, and Coventry’s 14th-century cathedral. It’s perhaps a little-known fact that many British cities, not just London, suffered severe bomb damage during the war. 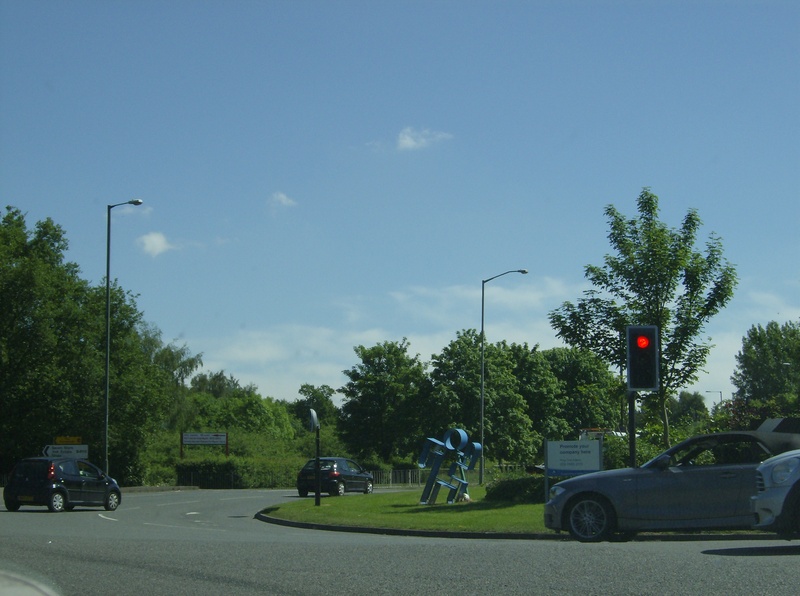 Not far beyond Coventry, we found Nuneaton; but finding our hotel was another thing entirely. We had its address set in our GPS, but there were a lot of new roads and dead-ends around the hotel and it was very confusing. Only after driving every which way around an industrial estate did we locate the place! 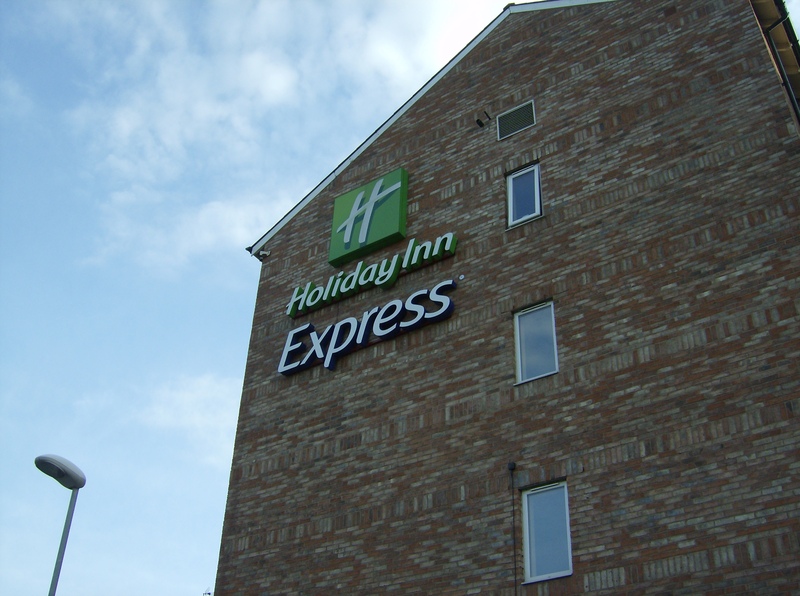 The staff at the hotel were very accommodating, and they let us check in early. I got to have a long-awaited nap, and after that we planned to take a little trip into Nuneaton, which turned out to be charming. As this trip demonstrated to my usually inflexible and perfectly organized mind, sometimes it pays to be spontaneous! I was so grateful to have the chance to go on this trip, but had I been stubborn, I wouldn’t have gone at all! Buckingham Palace, as well as the royal residences of Windsor Castle and Holyroodhouse, holds several receptions each year. 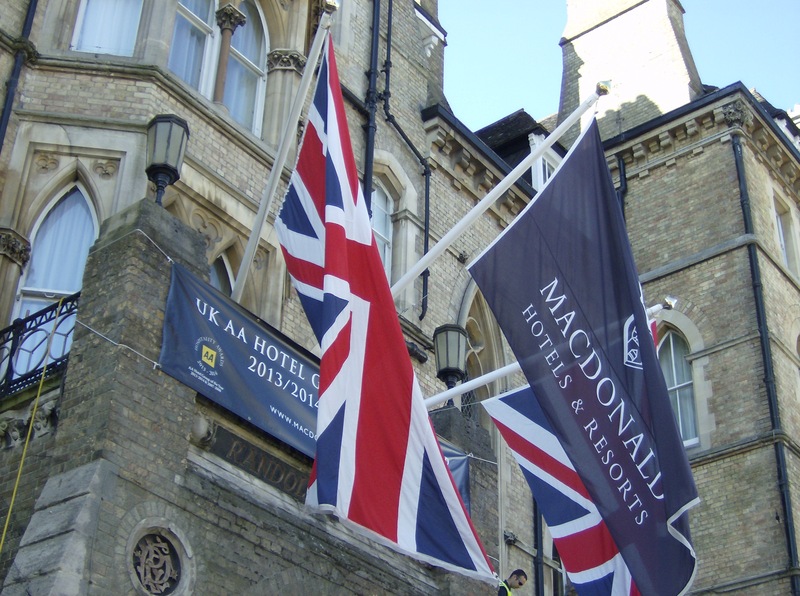 These receptions are hosted by Her Majesty Queen Elizabeth II, and are often held to recognize achievements or to mark state visits. I greatly admire Her Majesty for her dignity, composure, and dedication to her duty; and I’ve always dreamed of someday attending one of her receptions or garden parties. If I were to ever attend a reception at the Palace, I think I would have to wear an outfit inspired by the ’40s. The following Polyvore set would do nicely for such an event! An exquisite black lace dress from the ’40s is both stylish and appropriate for an event hosted by royalty, and the antique jewellery adds to the vintage vibe. The jewellery also mirrors the extensive gilding of the interiors of Buckingham Palace, so the wearer would not look out of place! A lace handbag gives continuity to the outfit, and contrasts well with the gold shawl and delicate champagne shoes. Finally, deep red Burberry nail polish finishes this look with glamour and a reverent nod to the best that the Kingdom has to offer. A few weeks ago my family and I were camping around Kingston, Ontario, and the Thousand Islands. 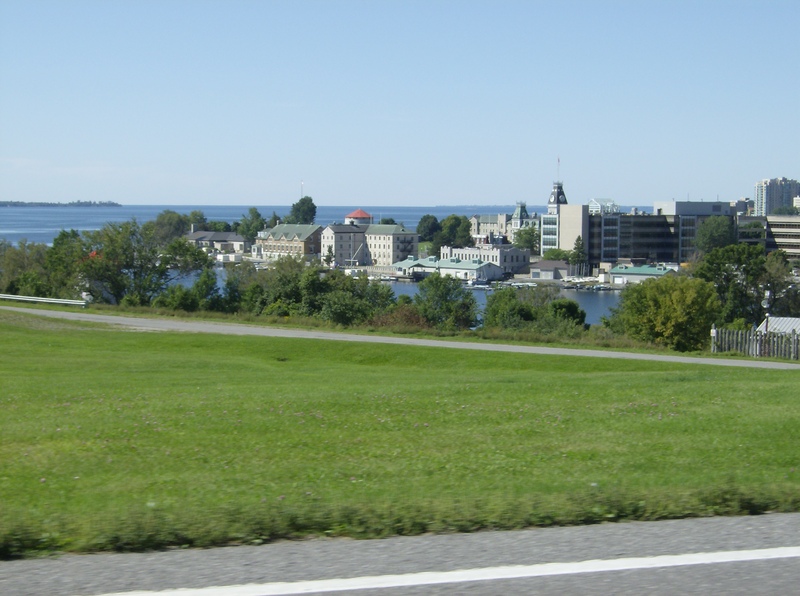 This region is defined by its proximity to the St. Lawrence River, which makes for very beautiful surroundings, and, historically, great strategic importance in times of war. The Thousand Islands area was central during the War of 1812, and retains evidence of this extensive military history even today. I was fortunate to have fantastic weather and lots of time in this fascinating area, and the following is a sample of what I saw. 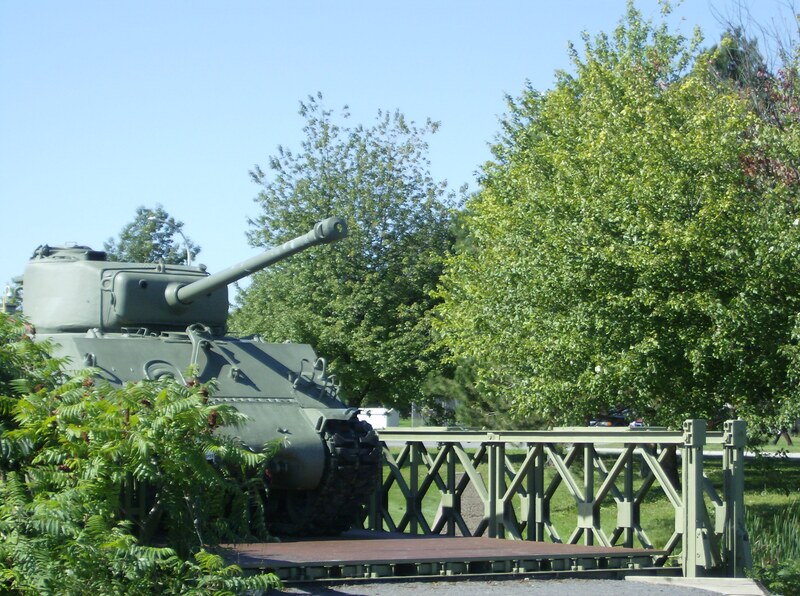 My family and I stayed at a campground about 10 minutes from the town of Gananoque, which is a cute little town with its own military history. 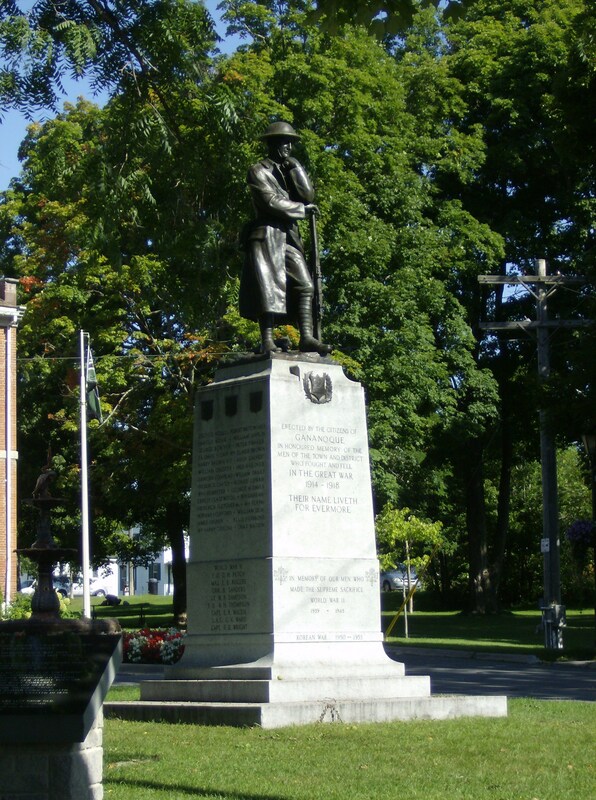 It was raided by American forces during the War of 1812, and one of its inhabitants was awarded the Victoria Cross for his actions in World War I. I took some time around Gananoque’s war memorial, which is located on the main street in front of the town hall. 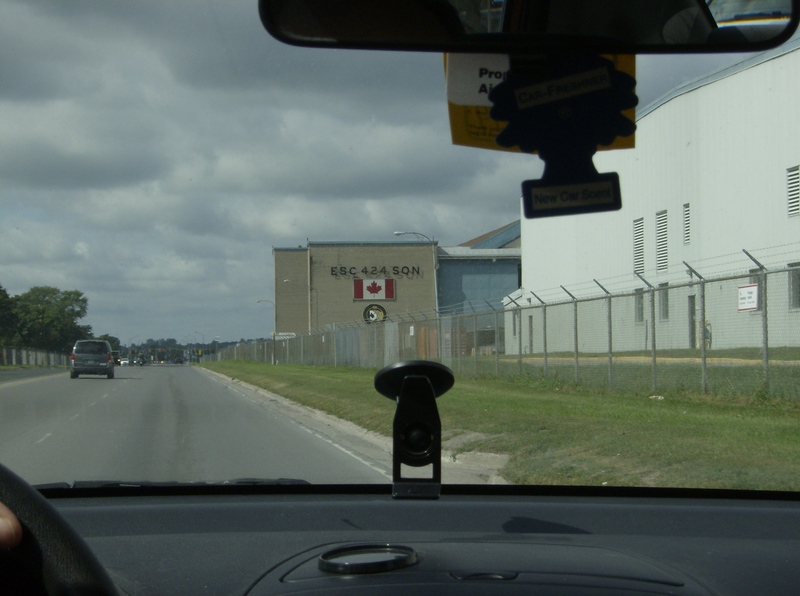 I also took a few trips into Kingston, which has a large and exciting concentration of military things. 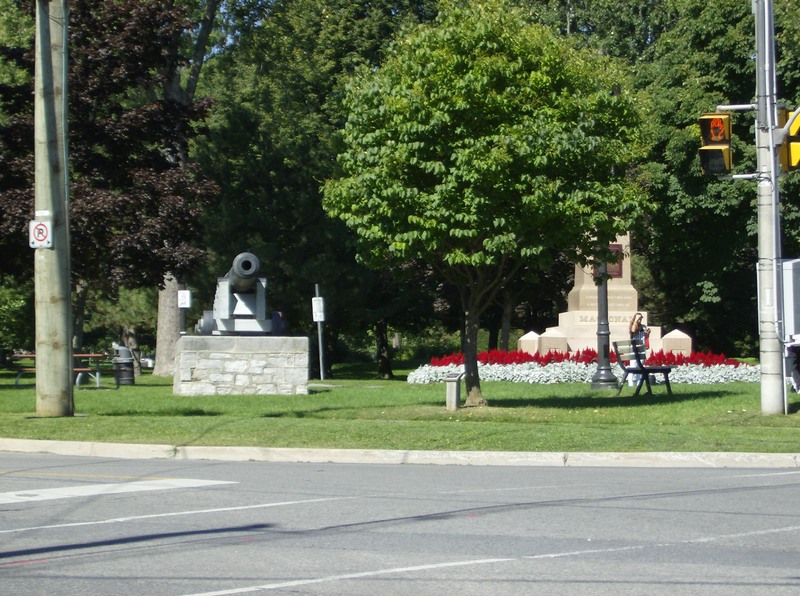 The city is home to CFB Kingston, a Canadian Forces base used mainly for training nowadays. RMC, or the Royal Military College of Canada, is also located in Kingston. 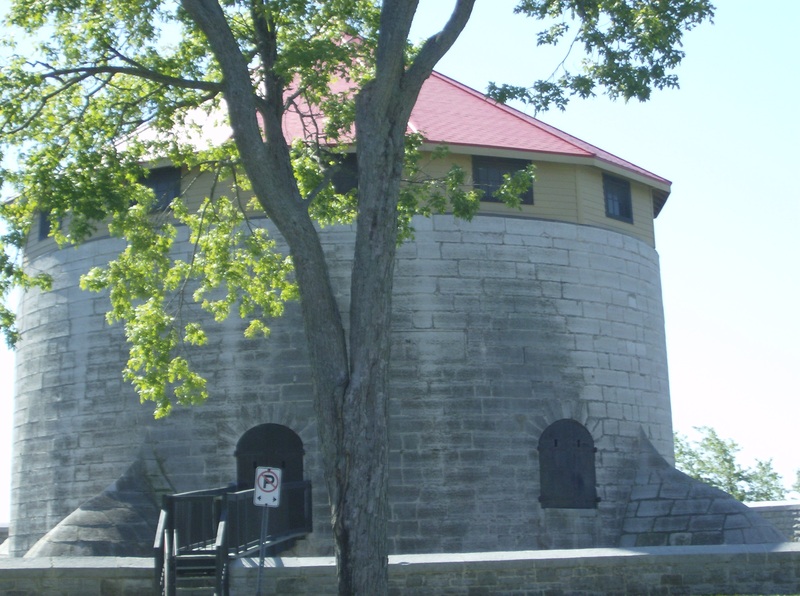 As well, Kingston boasts Fort Henry, a fort built by the British in the War of 1812 to protect the dockyard and shipping along the St. Lawrence. Military installations both old and new are everywhere in Kingston, so I really enjoyed being there. 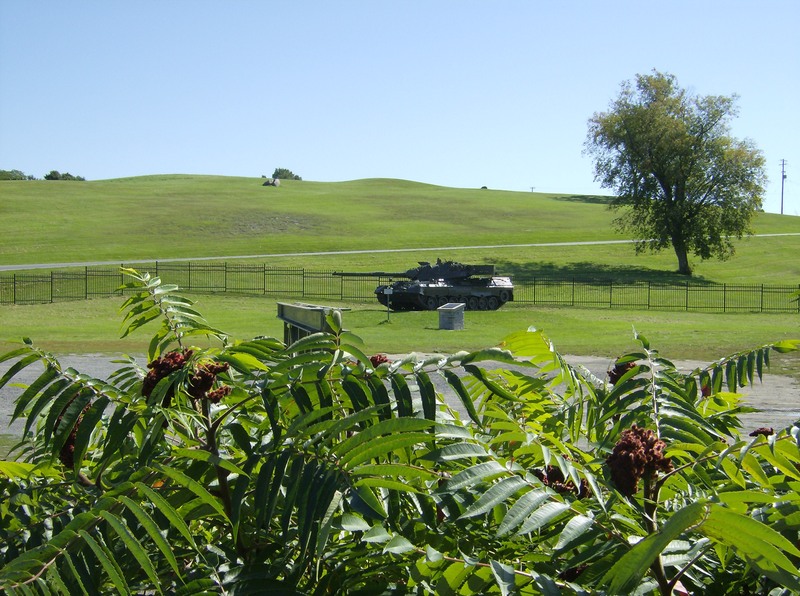 At the base of Fort Henry’s hill, and near the entrance to RMC, we came across two significant tanks. The first was a Sherman, perhaps the most ubiquitous Allied tank of WWII. It was parked on a bridge amongst some brush and trees, which made for a very authentic setting. Couldn’t this photo be from somewhere in France in 1944? 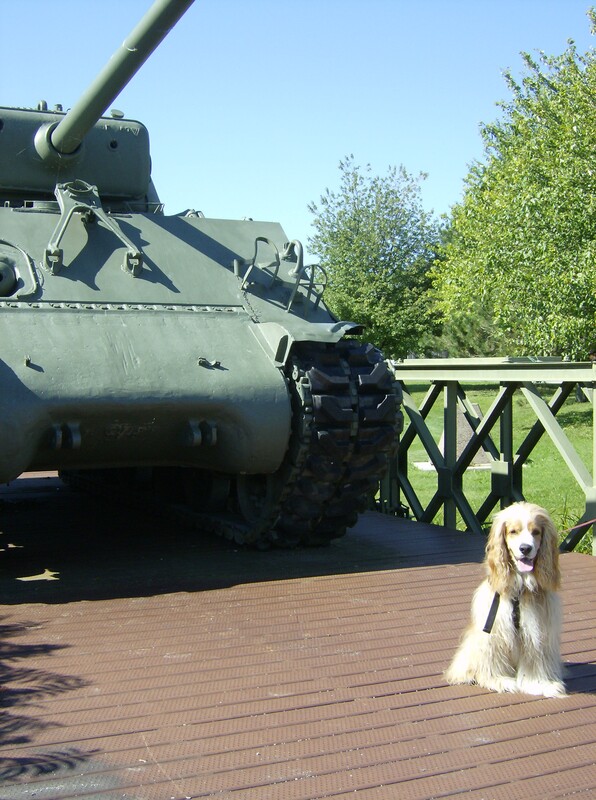 My dog Crumpet is scared of a lot of things, but for some reason he likes tanks! The second tank was a German-built Leopard 1 C2. 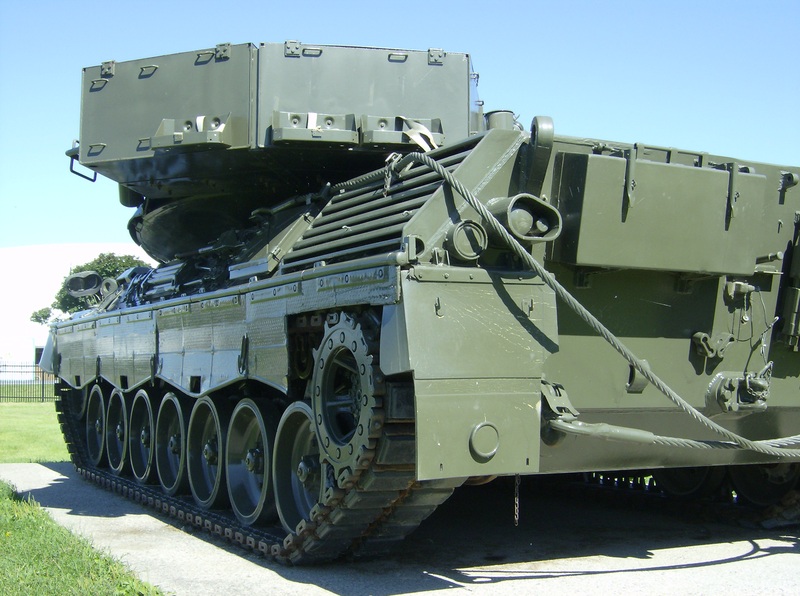 The C2 variant is an upgraded version of the Leopard 1, which was first used in 1965. 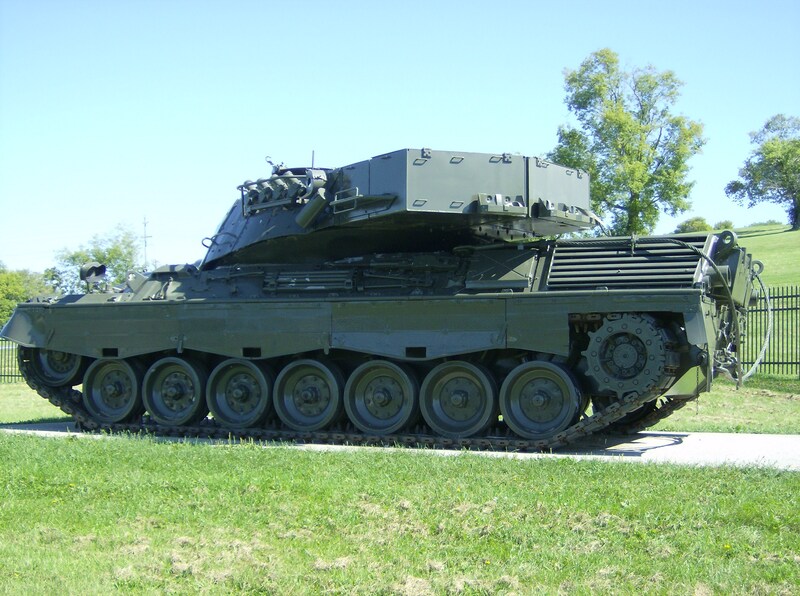 The Leopard C2 was deemed inappropriate for use in Afghanistan, so more modern Leopard 2 tanks borrowed from Germany have been used by the Canadian Forces in combat. 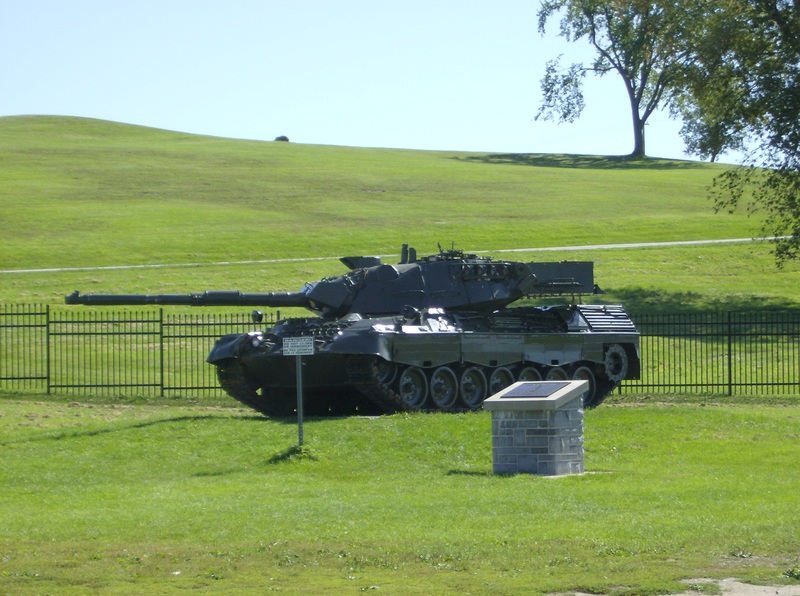 The Leopard C2 is still a neat tank though, and its modern appearance makes it hard to believe it hails from the ’60s! 50 miles east, in Brockville, I was delighted to see the military theme continued. 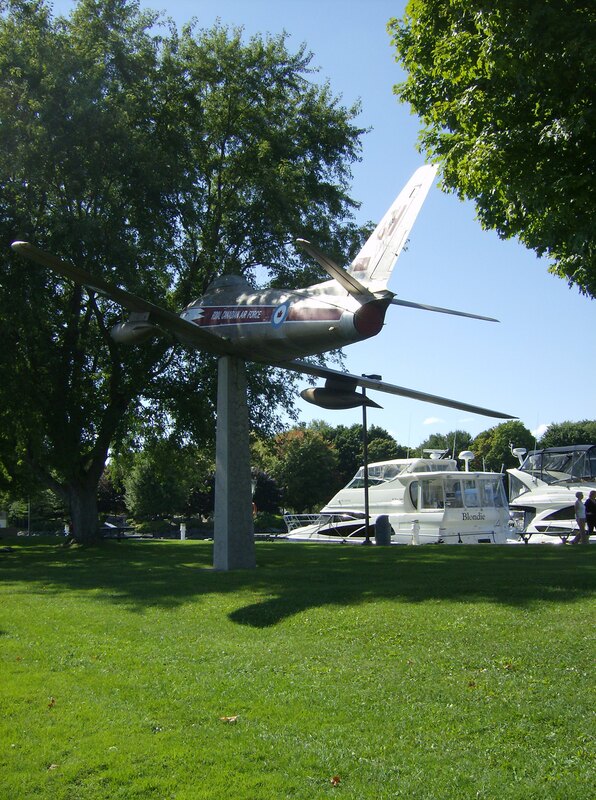 At Brockville’s popular marina, there was an Canadair Sabre Golden Hawk monument. 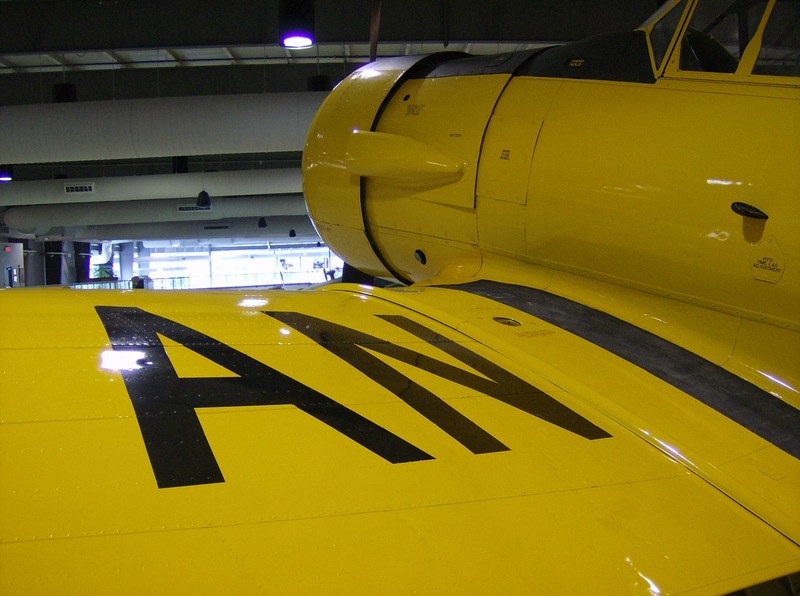 The Golden Hawks were an RCAF aerobatic team active from 1959-1964; they flew special gold and red painted Sabres and pioneered several aerobatic manoeuvres. 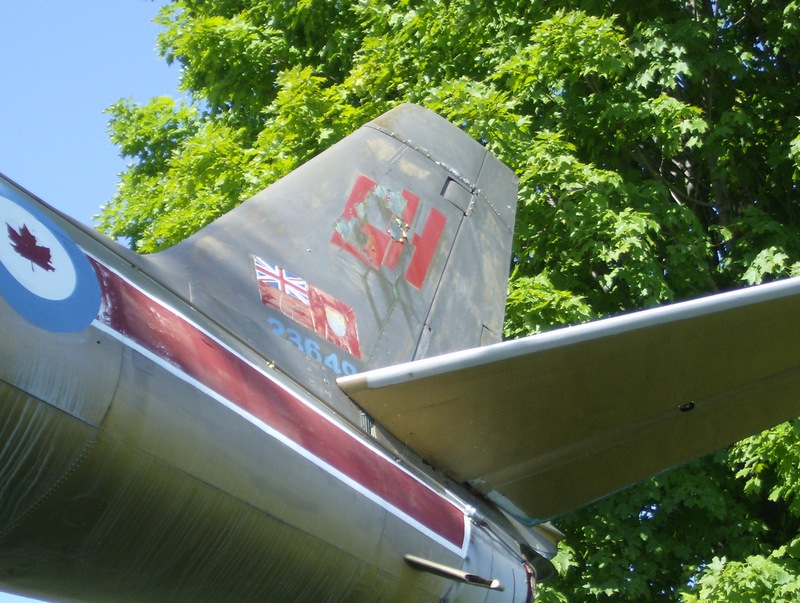 Although one restored Canadair Sabre (named Hawk One) keeps the Golden Hawks scheme alive and airborne, it was very interesting to see an actual Golden Hawk in person. 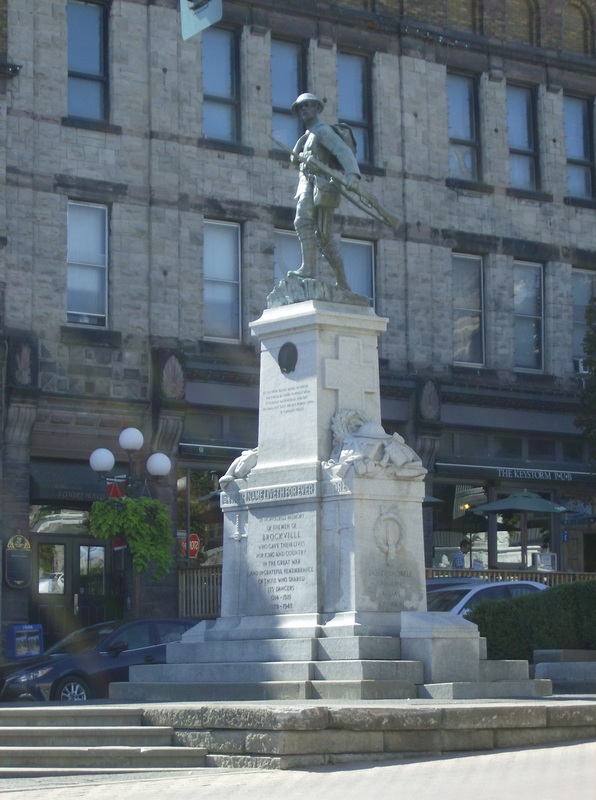 I’ve read that one of the Golden Hawks’ bases was CFB Trenton, which is about an hour west of Kingston; so perhaps that’s why we found this monument in Brockville. 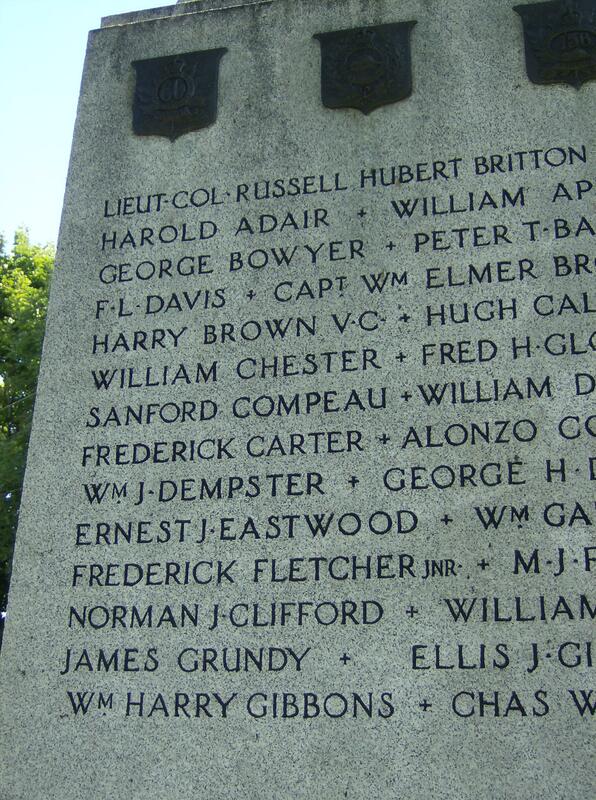 I’ll finish this post with a photograph of the war memorial in downtown Brockville- a reminder that, due to the existence of 19th-century fortifications, Cold-War aerobatic teams, and modern military bases, the Thousand Islands region respects and honours its military past. 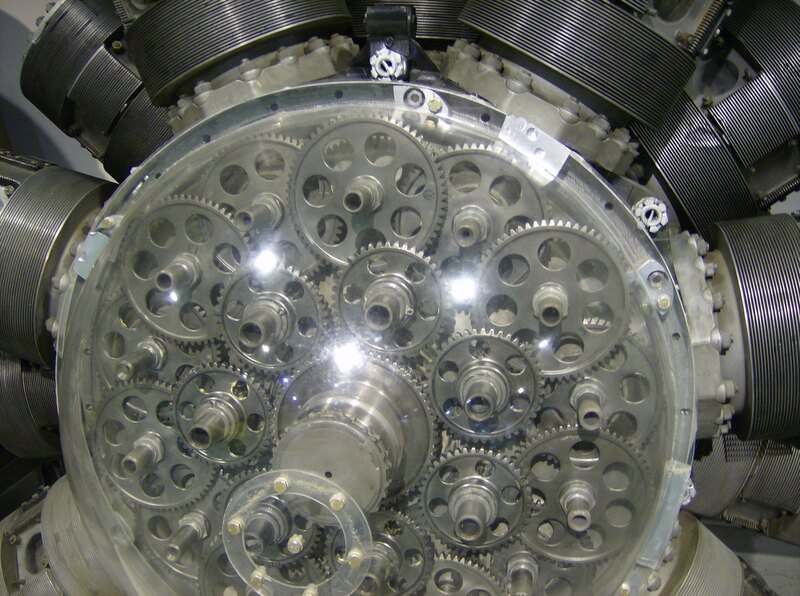 In recent years, the military trend has seen great popularity all over the world. Olive drab and khaki are seen in many a jacket and cargo pant nowadays, and classic military tailoring has also made a comeback. Leather combat boots are sold in droves at every store, and the tough military look has become a favourite of many people. But military style does not have to be solely inspired by the army– the air force and navy also have distinctive and appealing uniforms which would add much to the fashion of today. This Polyvore set is inspired by vintage RAF uniforms; the pilots of the Battle of Britain always looked so smart in their grey-blue dress uniforms! But this outfit also combines minimalist, modern touches, and other details which add to its aviator theme. The blue blouse is reminiscent of a commercial pilot’s uniform, while the classic neckscarf is similar to those worn by flight attendants during the Golden Age of Air Travel. The satchel, tailored pants, military boots, and Timex watch are subdued pieces which allow the rest of the outfit to shine- namely, the beautiful coat, aviators (of course! ), and airplane charm bracelet. Finally, fantastic gold earrings with a shape akin to spinning propellers add a final touch of authentic charm to this look. I appreciate air force style just as much as I do army style- and I hope that upon seeing this outfit, you will too! Toronto’s annual airshow, the Canadian International Air Show, happens every Labour Day weekend along the waterfront of Ontario’s capital. I attended it once or twice when I was very young- an irritating fact now, since I apparently saw the Red Arrows aerobatic team perform, yet remember absolutely nothing about it! This summer I attended again, for the first time in many years. In the past, the CIAS has had incredibly impressive line-ups, including the Blue Angels, Harrier jump jets, a Luftwaffe Phantom and Tornado, WWII aircraft, and a fantastic A-10 Warthog. 2014’s line-up was comparatively sparse and home-grown, but it remained an enjoyable spectacle. What wasn’t so amazing was our seats- to avoid the crowds and admission fees, we sat maybe a kilometre from where the show is actually staged, so many of the airborne displays were pretty distant from our vantage point. 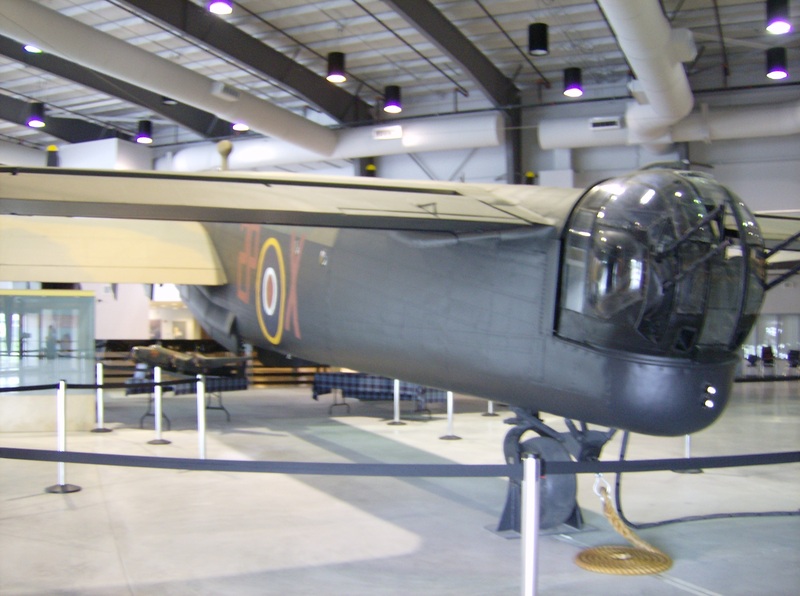 Surprisingly early in the show, Canada’s current fighter jet appeared. The CF-18 Hornet, manufactured by McDonnell Douglas, is a versatile and seasoned multirole fighter. It is powered by two General Electric turbofans, and features nine hardpoints which can carry bombs, missiles, or rockets. 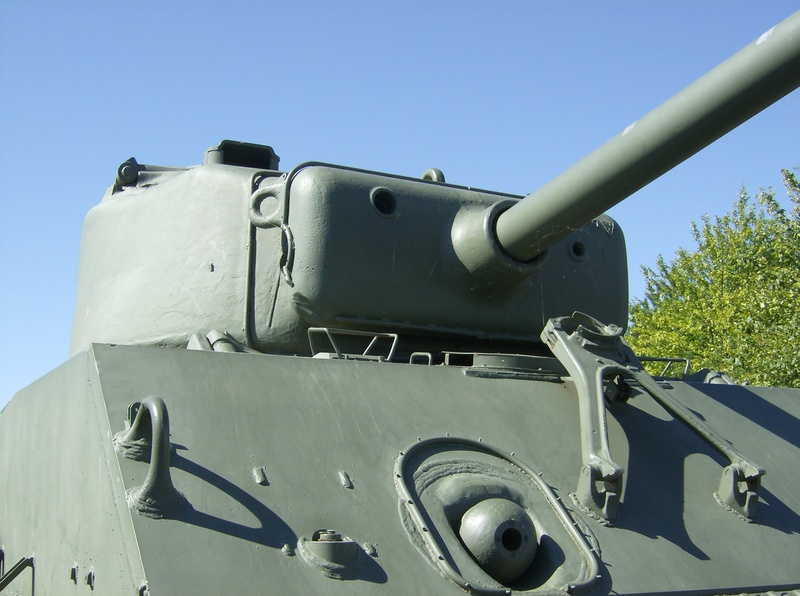 It also has a Gatling cannon mounted in the nose, which may not be often used in today’s combat situations, but which is impressive nonetheless. 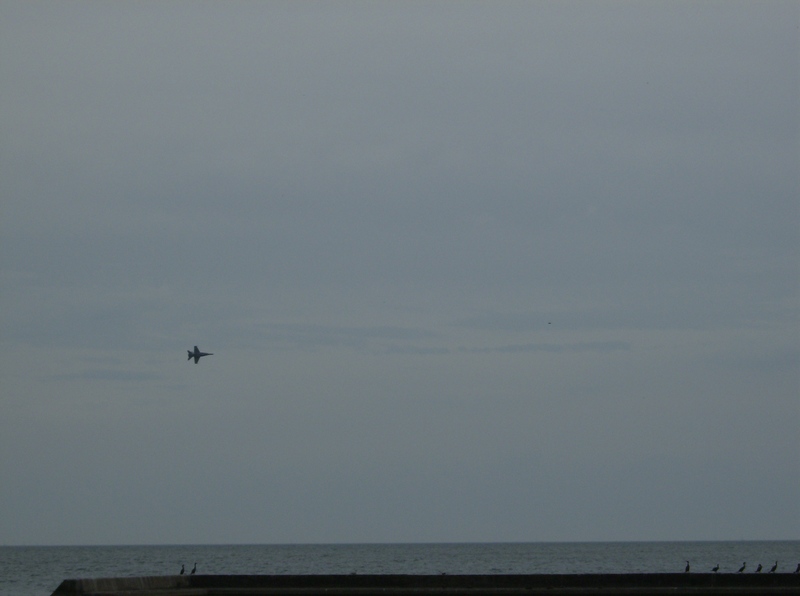 Canada’s fleet of Hornets is aging, but the CF-18 remains a fantastic aircraft to watch at airshows. 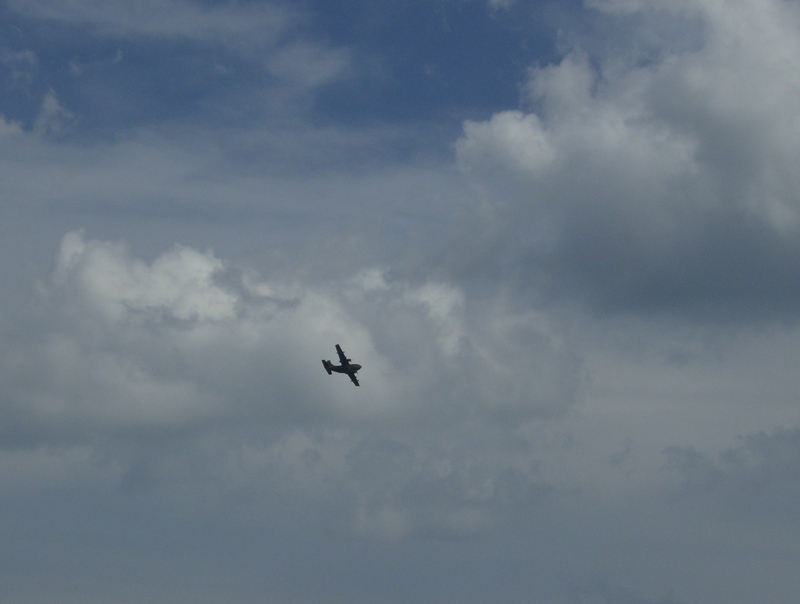 Another performer (which I remembered from the Hamilton Airshow of 2013) was a Beech 18 which gave us an exciting aerobatic display. Utility planes from the late ’30s didn’t make their name based on their aerobatic capabilities, so it was fun to see such a plane spiralling around the sky. Another plane not renowned for manoeuvrability at the CIAS was the C-123 Provider- also known as the “Thunder Pig”. 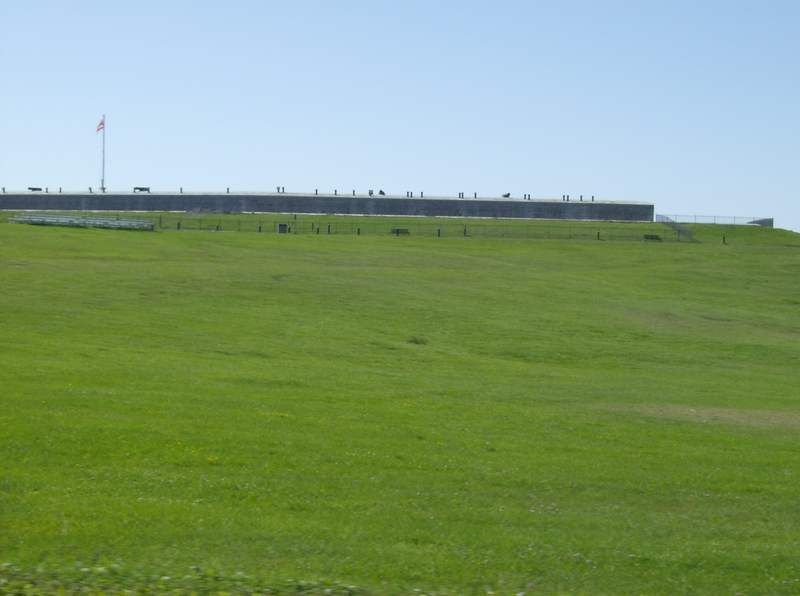 Although we had an amazing view of its entrance and it looked very familiar, we had no idea what it was until after the airshow. 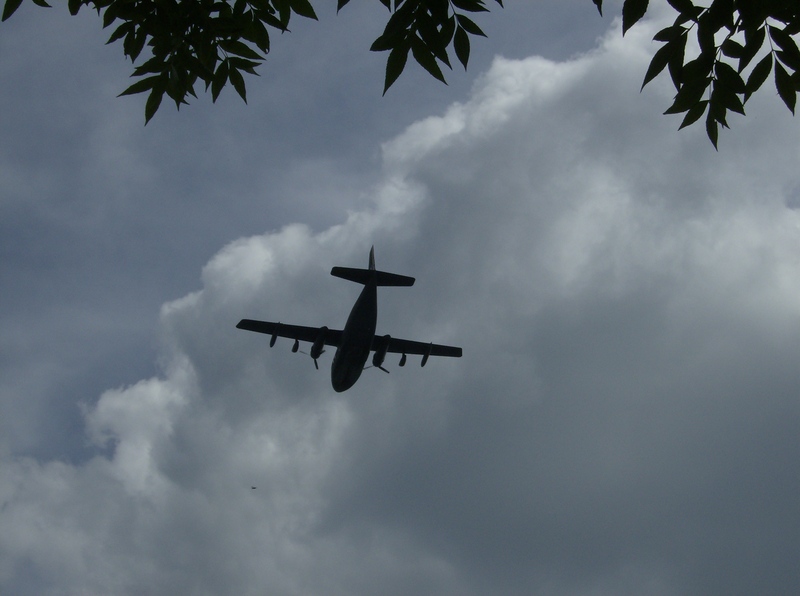 We could tell that it was roughly from the Vietnam era, and that it wasn’t a C-130 Hercules, but that was about it. It turns out that the C-123 was built by Fairchild Aircraft for the USAF, and was used during Vietnam to drop Agent Orange. So it has an unpleasant operational history, but it was a fascinating plane to see. 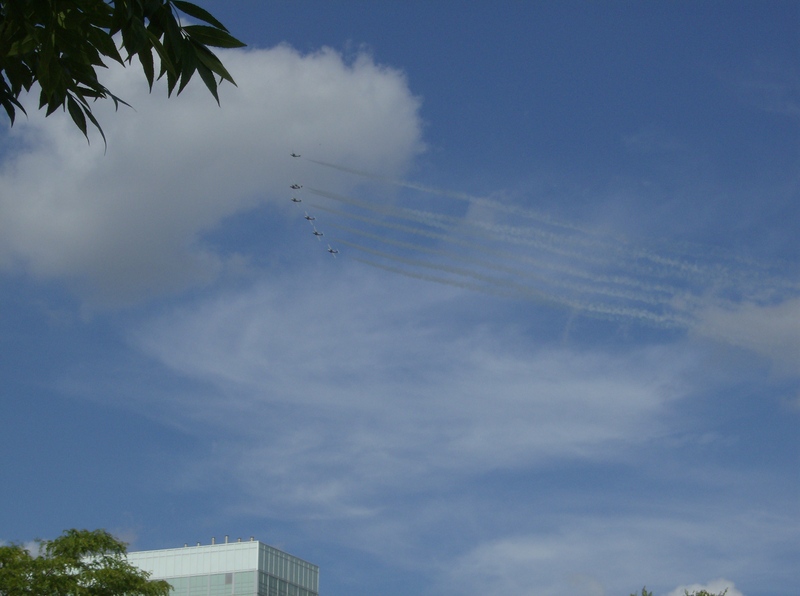 A true Canadian staple came in the form of the Snowbirds demonstration team. This team of nine utilizes the CT-114 Tutor aircraft, which served as the Royal Canadian Air Force’s jet trainer until 2000. 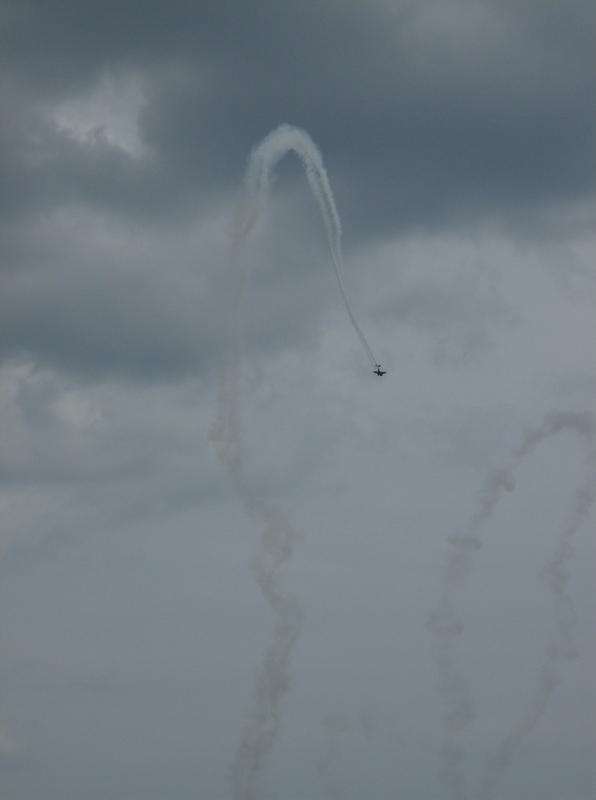 I think that the Snowbirds display would be quite awe-inspiring to someone who hasn’t seen it before, but I’ve seen it three times in the past three years and it’s gotten staid to me. 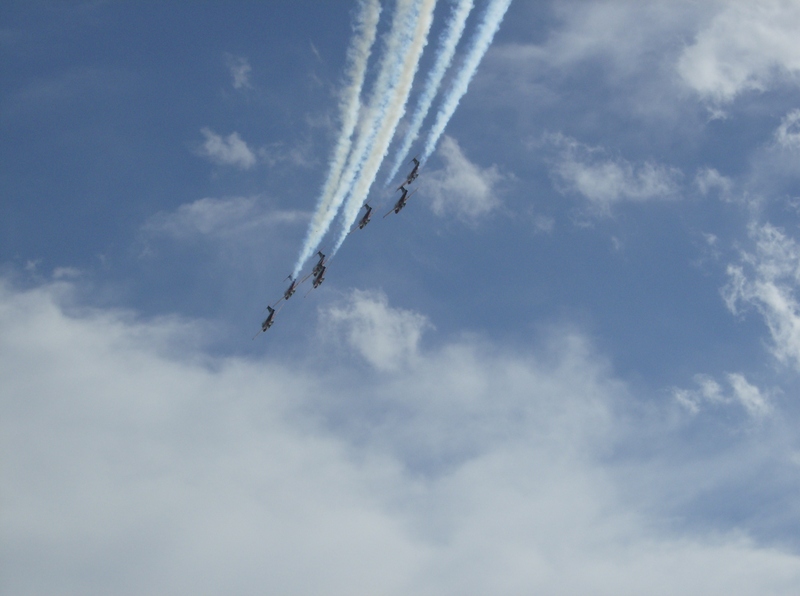 But despite my thoughts on the Snowbirds, they do have several spectacular elements; and aircraft flying in formation is a cool sight. Throughout the show we saw planes from many countries and eras; such as a razorback P-51 Mustang, a Soviet An-2 Colt biplane (the world’s biggest single-engined biplane), a T-33 Shooting Star, and four WWI aircraft including a Fokker Dr.I triplane. 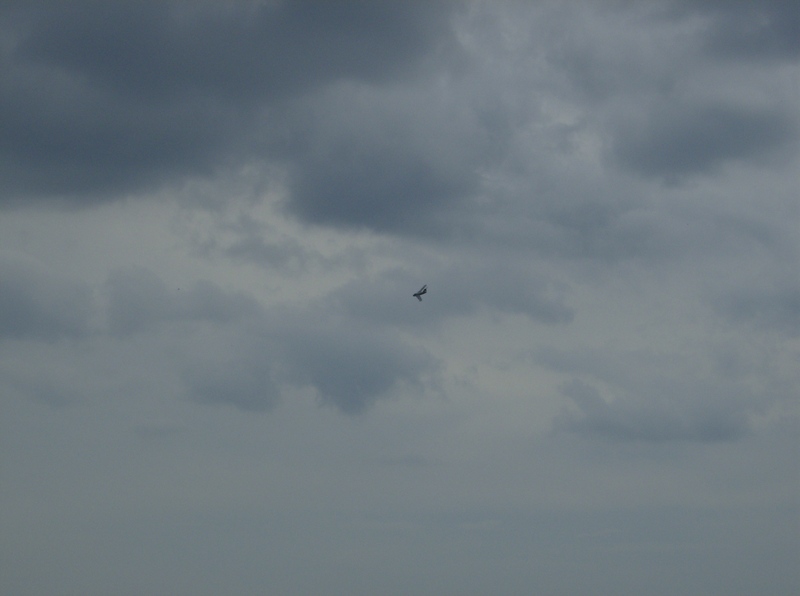 But my favourite plane of the airshow was the one I attended for- a real MiG-17! The MiG-17 Fresco was devised by the Soviet Union in the early 1950s, and was one of the USSR’s first jet-powered aircraft. 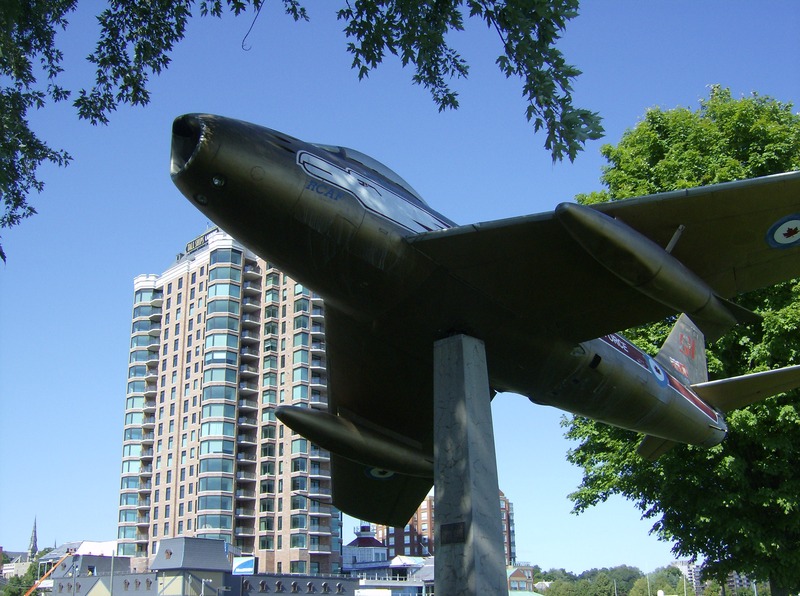 It resembles both its predecessor the MiG-15 Fagot, and its American opponent the F-86 Sabre. Vietnamese MiG-17s faced American F-86s during the Vietnam War, and- to the genuine surprise and dismay of the Americans- claimed over 70 aerial victories. These subsonic Soviet planes managed to successfully combat such state-of-the-art aircraft as the F-105 Thunderchief and F-4 Phantom. As a huge fan of Soviet aircraft and military history, I was thrilled to see a real-life MiG. 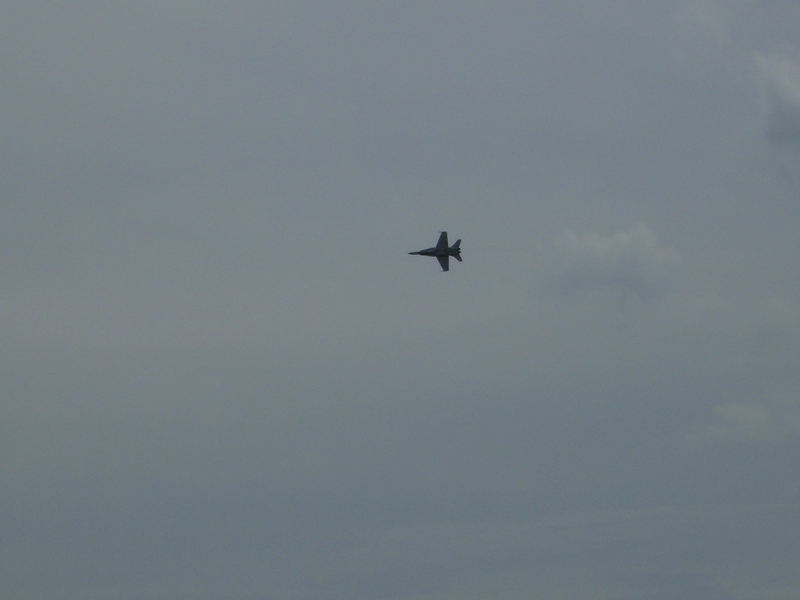 It was the first flying MiG I’ve ever seen, and it was something to remember. So although CIAS 2014 didn’t boast the Blue Angels or a Tornado, it still impressed me and made for a special and memorable afternoon. 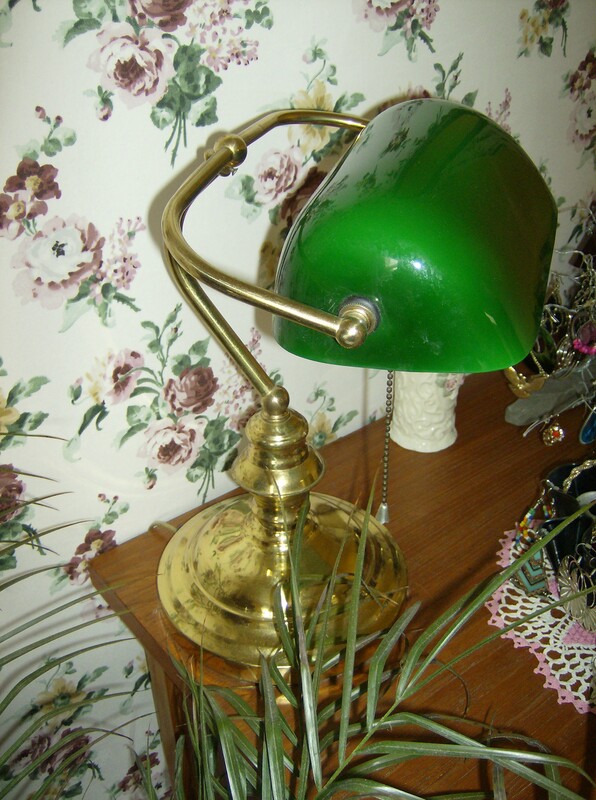 As many of you may have gathered from this blog, I am enamoured with the distinctively stoic and old-fashioned decade of the 1940s. 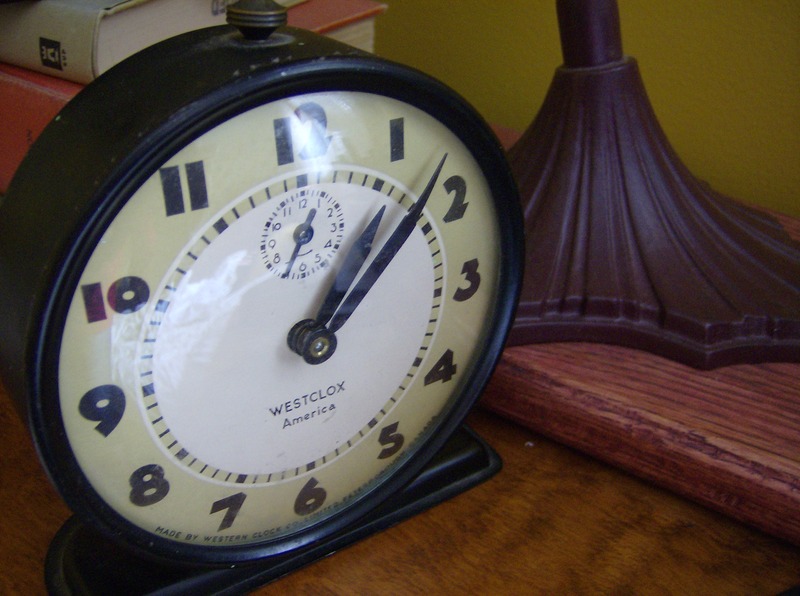 I often feel that my mind lives in the ’40s, and when I’m in my bedroom, I feel like I’m actually in that decade of nostalgia, fortitude, and old-fashioned stoicism. My room used to be a real riot. The walls were a deep shade of hot pink, with tropical-patterned soft furnishings. 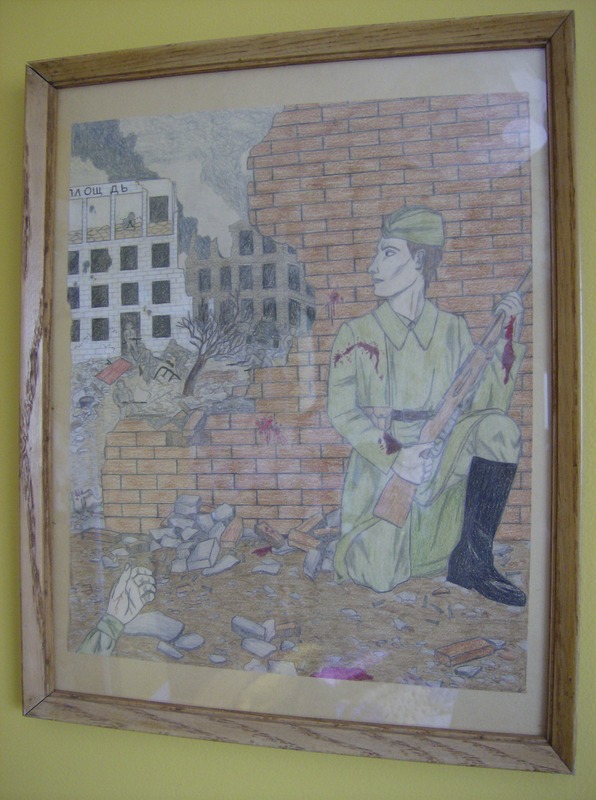 There were posters all over the walls, and the effect was one of clutter, immaturity, and general unsophistication. 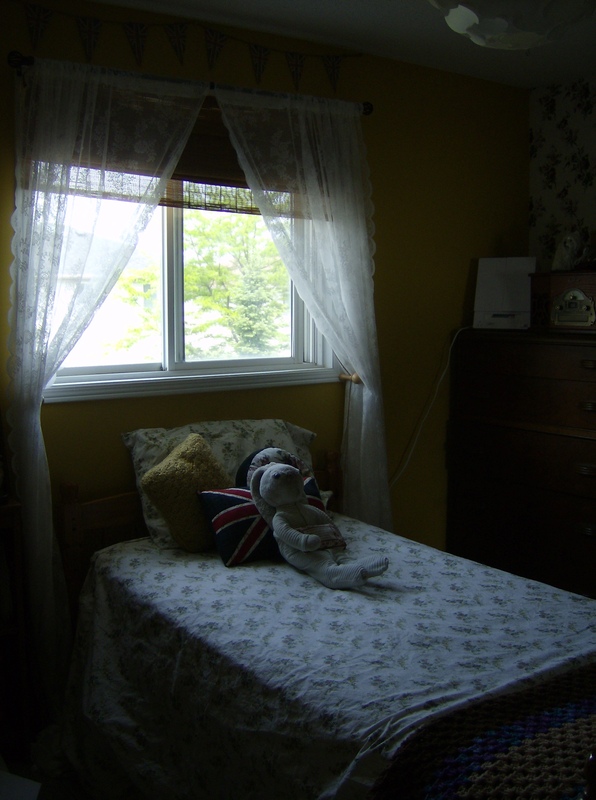 I finally redecorated last summer, eager to honour my love for the ’40s. ’40s style may not be a popular choice in many modern homes, but it’s really a beautiful, eclectic, nostalgic style, and I love it. 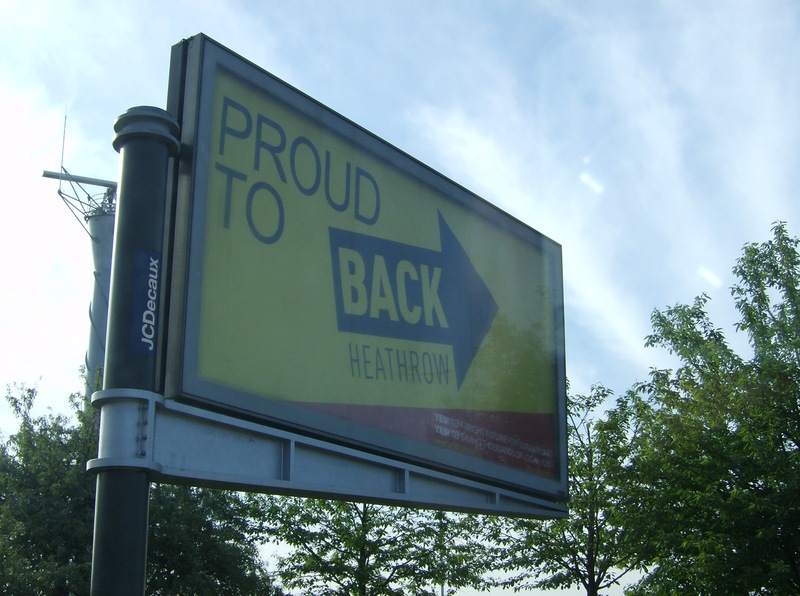 I had a clear vision of what I wanted, and thanks to my mum’s help this vision was enacted perfectly! The light in this photo is uninspiring, but the decor is anything but… trust me! I wanted a golden mustard colour on the walls, which was inspired by two throw cushions in a charming and very ’40s Cambridge cottage I stayed at in 2011. I also wanted one wall to have wallpaper, but not just any wallpaper. It had to be white or off-white to brighten the room, and to have a vintage floral pattern with muted tones and classic style. Wallpaper turned out to be too expensive, but fortunately fabric was another wall-covering option, and I found the perfect fabric at Ikea. 1940s interior style needs homey, old-fashioned touches, so lots of antiques and slightly distressed finishes are appropriate. But what I really love about ’40s style in the home is the necessity for personal touches- imagine a 1940s mantelpiece with black and white family portraits, or a settee with hand-embroidered cushions from one’s grandmother. I’ve always treasured family heirlooms and vintage pieces, and it’s wonderful that they now truly agree with my room’s aesthetic. 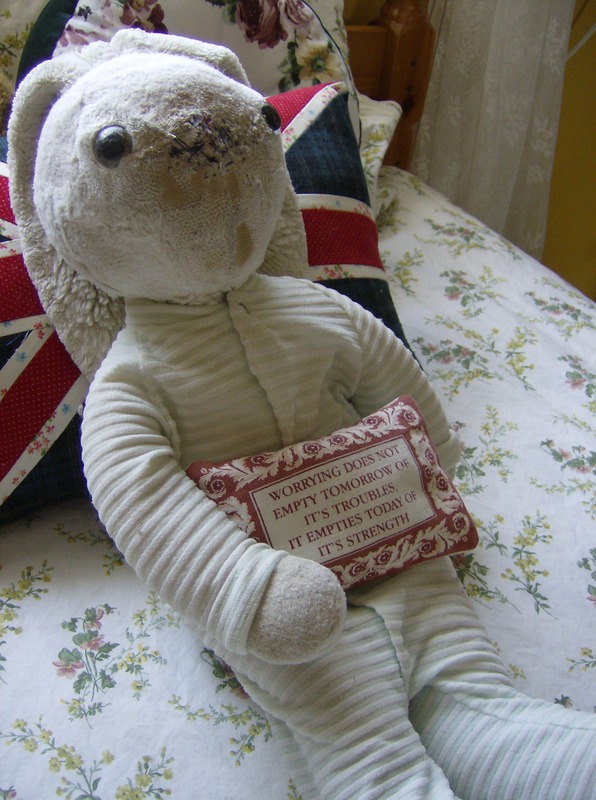 Flopsy, my companion from the day I was born. 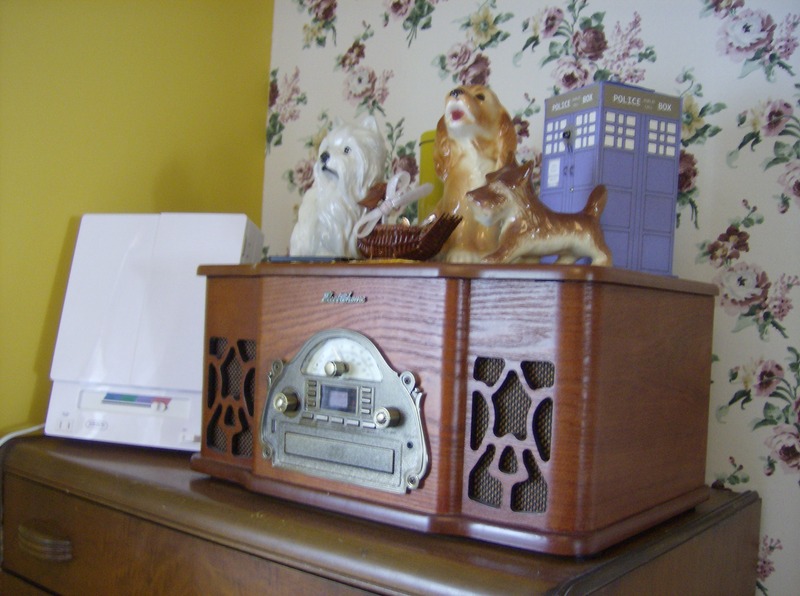 I also love collecting knick-knacks, which thankfully also agrees with my ’40s-styled room. Fueled by my wonderful cousin, second-cousin, and aunt, I have a growing collection of vintage glass dog figurines which inhabit almost every corner of my room. A modern radio- but it looks like it could have broadcast news from the front and speeches from Churchill himself! One final personal touch is a great source of pride and really brings World War II- the defining feature of the ’40s aesthetic- to mind. Adjacent to my bed, I have two framed illustrations that I did myself; and if my schedule allows, I hope to have a third one to add before too long. 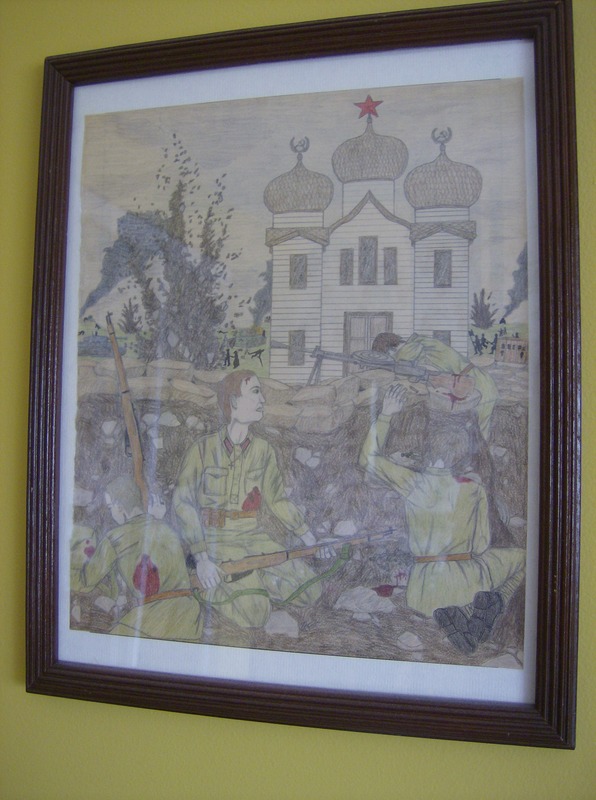 They depict fictional (though not unrealistic) scenes from the Eastern Front, and I feel reverent every time I look at them. 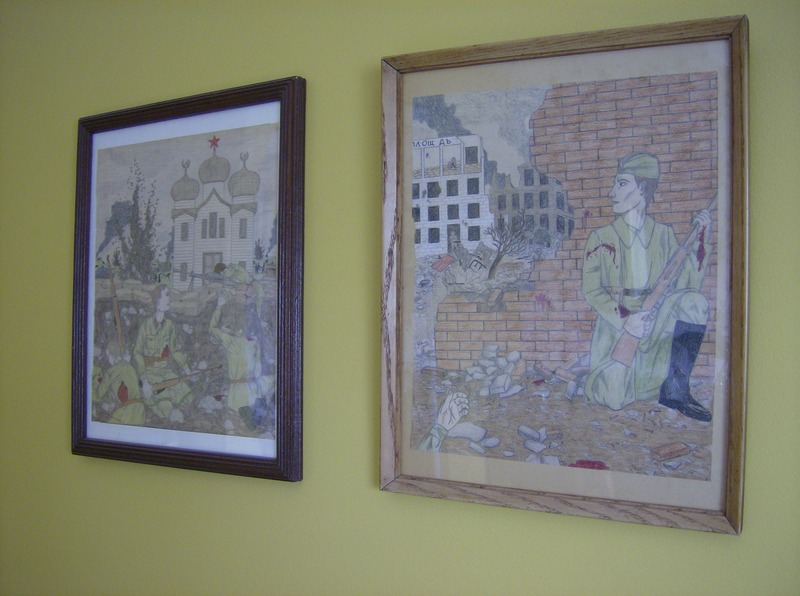 To me, these scenes are the centerpiece of the whole room, and they remind me why ’40s style and WWII are so important to me. Whenever I go into my room, I feel calm and truly at home thanks to the decor. 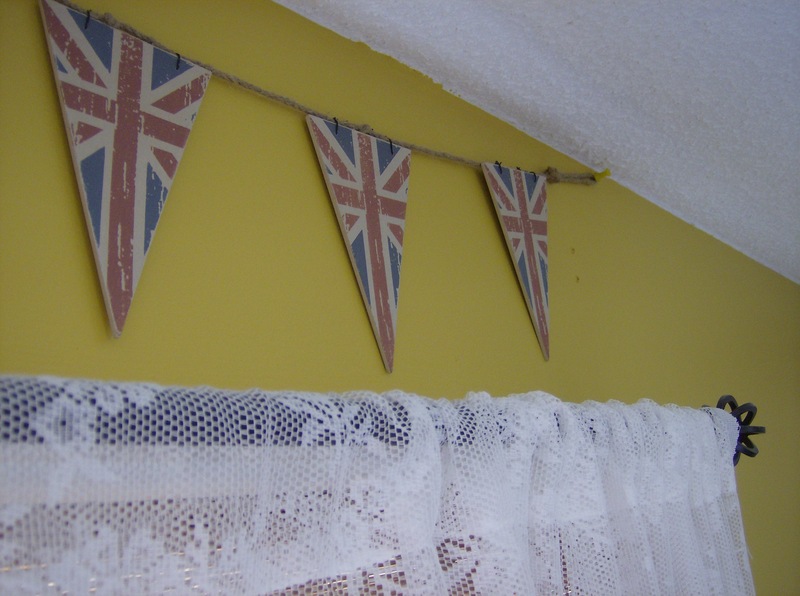 It’s vintage, wartime-inspired, cosy, and it reminds me of Britain and my heritage to top it all off. It’s a strange thing to have a ’40s mind in the 21st century, but since redecorating my room, I don’t feel quite so out of place.